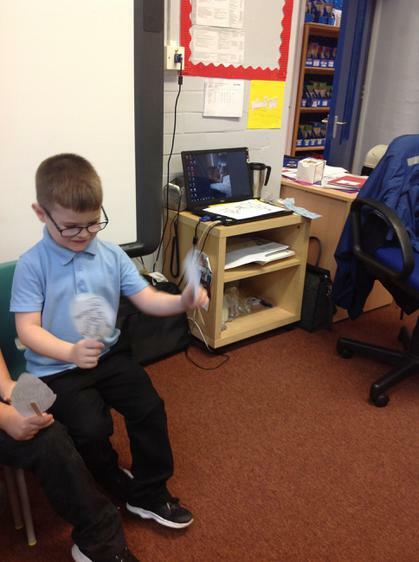 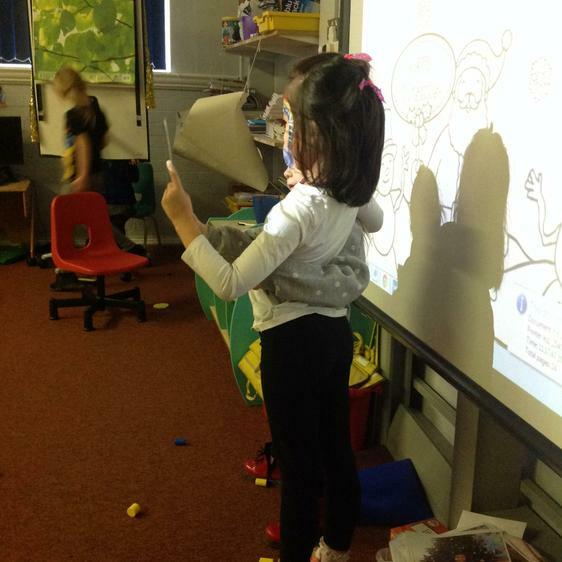 In ICT this term we are learning how to use an iPad to take phographs. 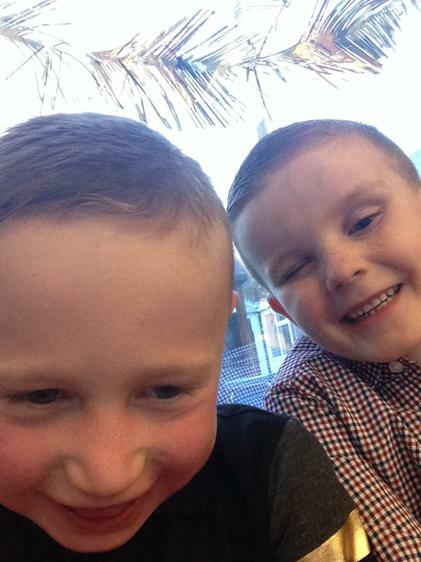 We decided to start by taking selfies. 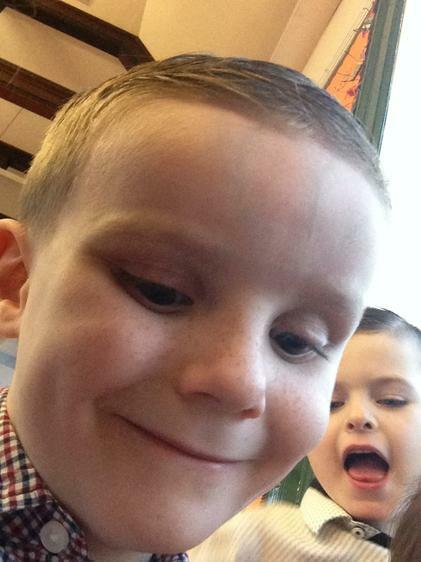 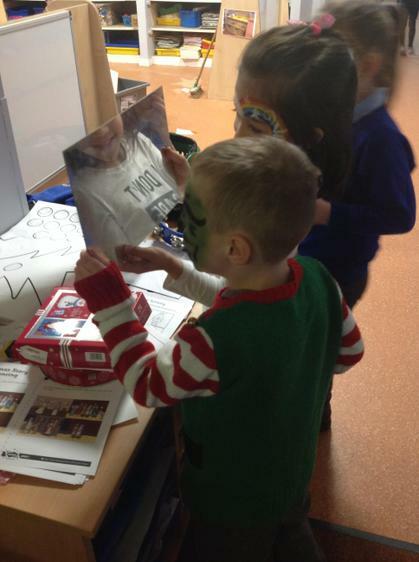 We talked about what makes a good/bad photograph then learned how to take a selfie and then print it out. 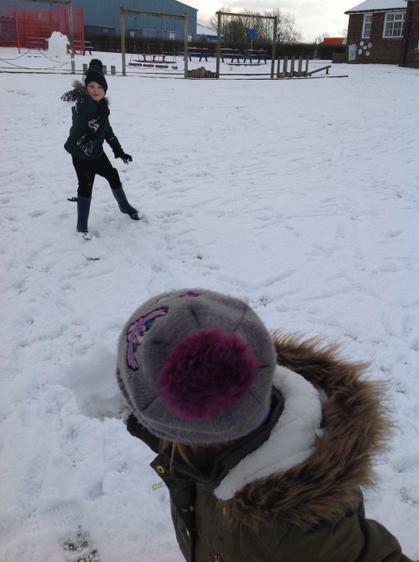 Over the next few weeks we will be and learning how to crop and edit our photographs. 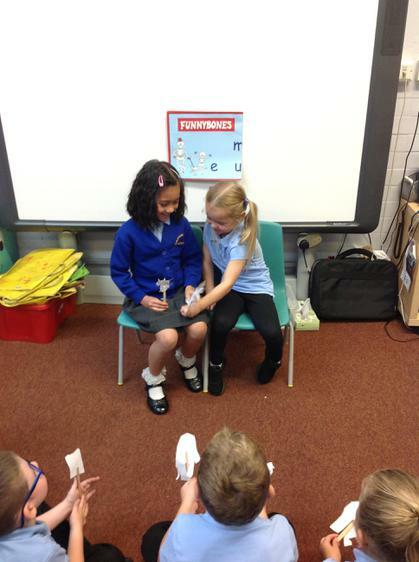 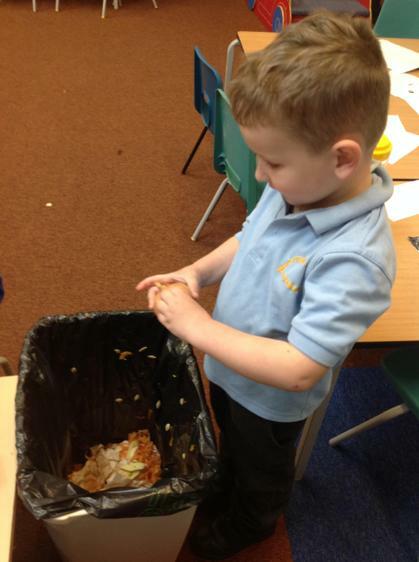 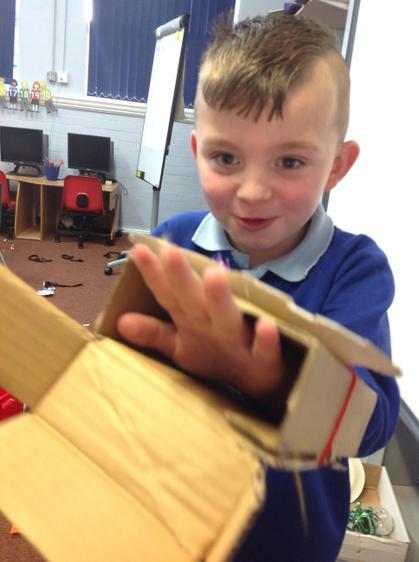 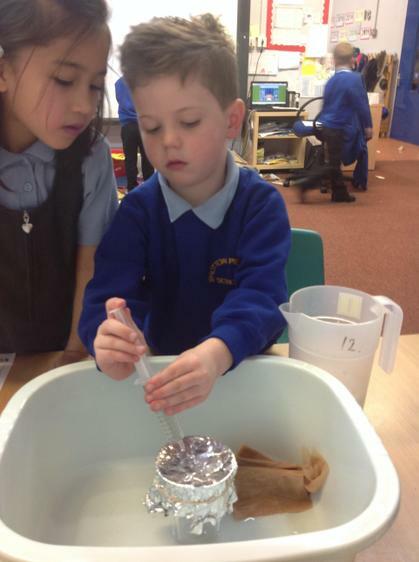 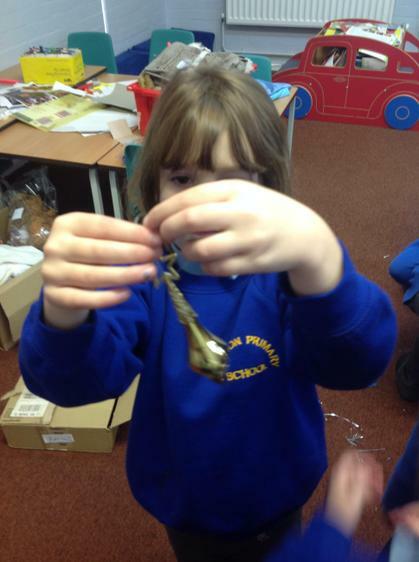 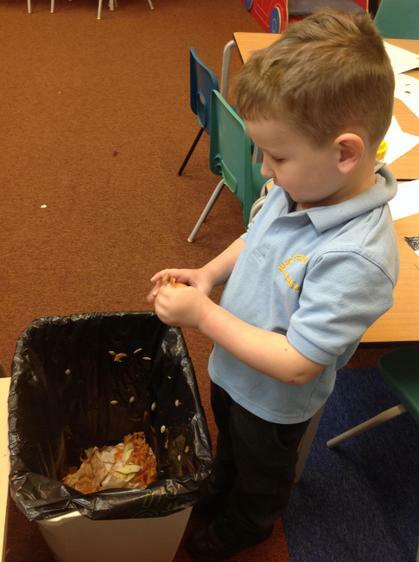 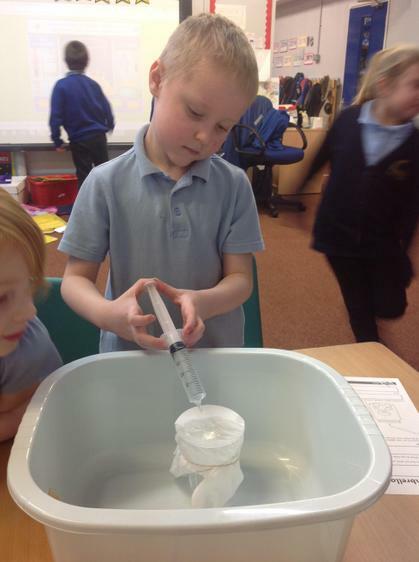 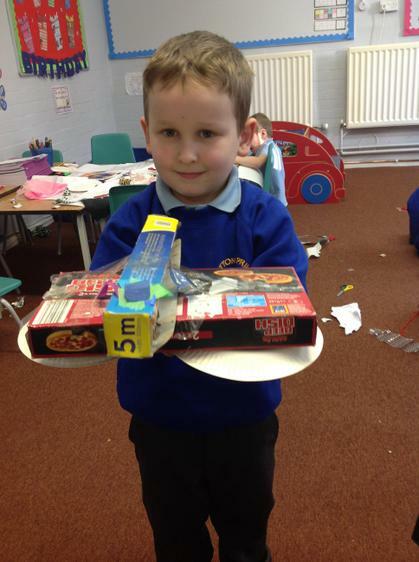 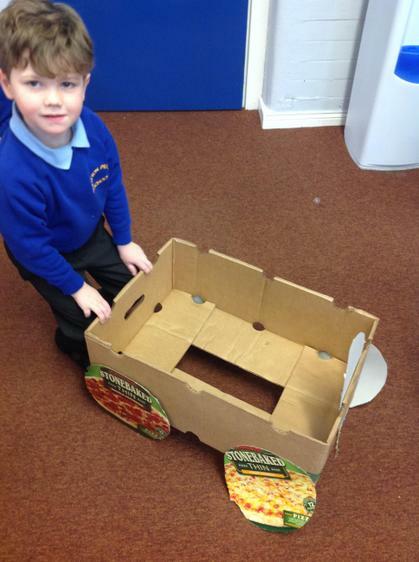 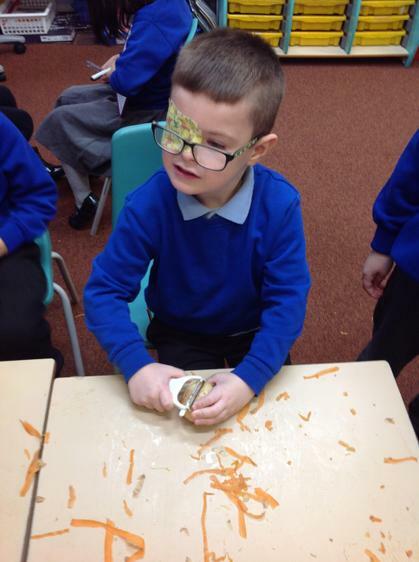 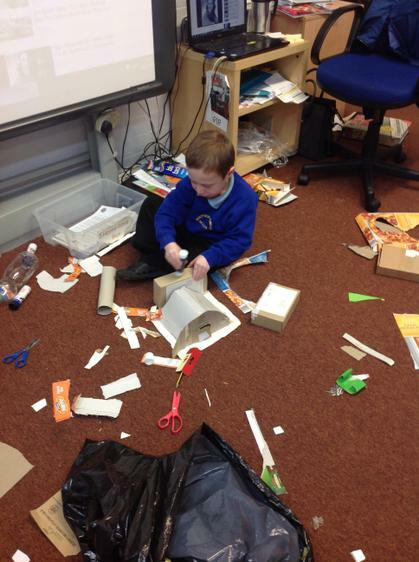 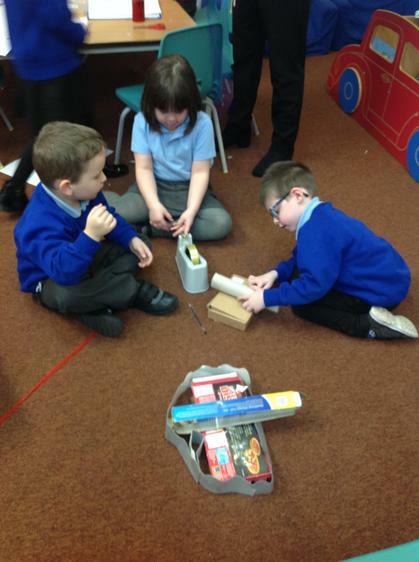 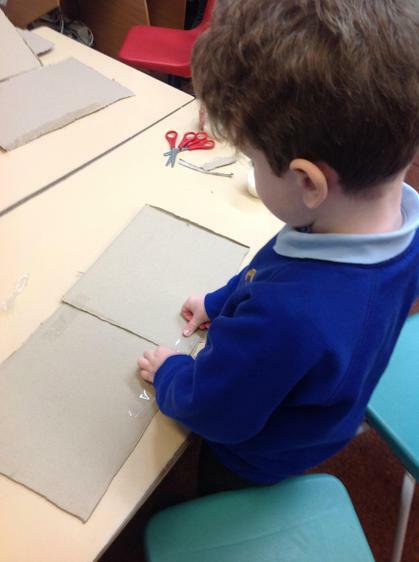 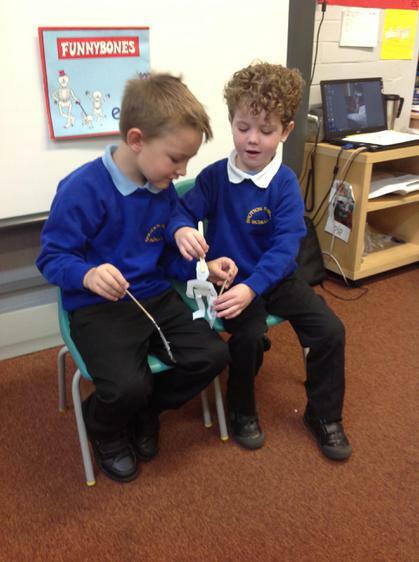 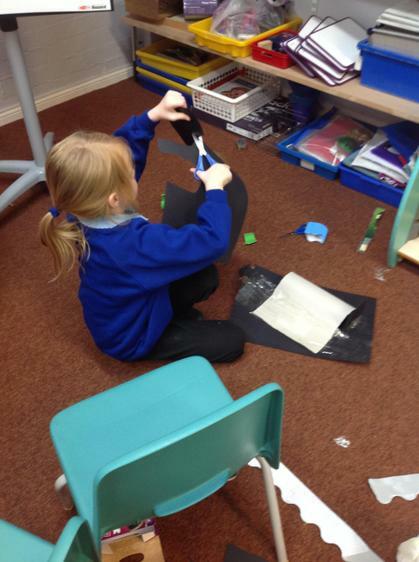 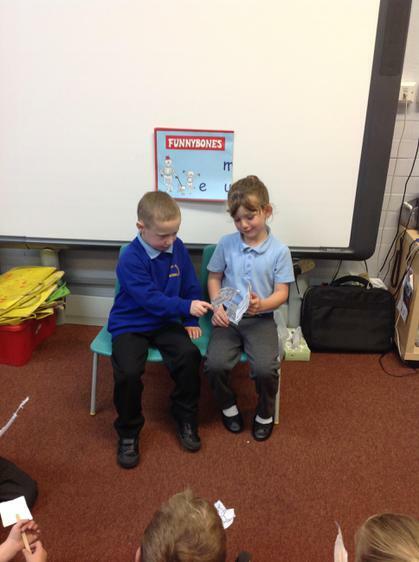 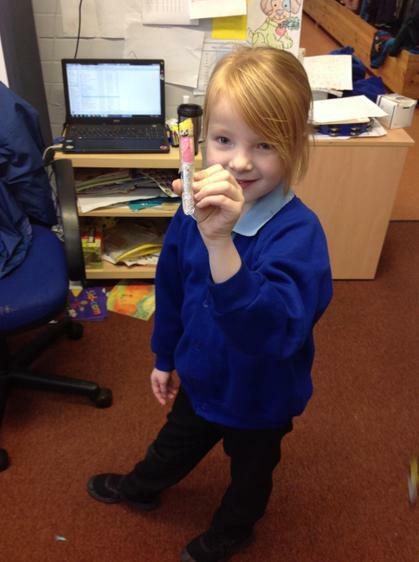 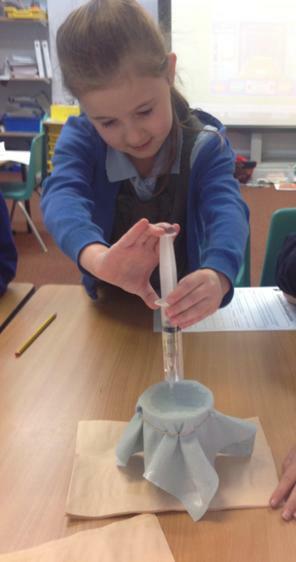 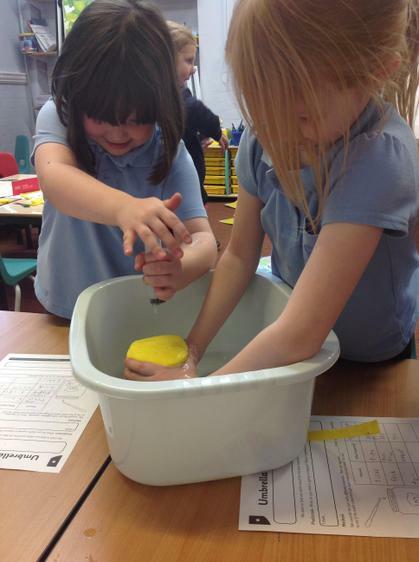 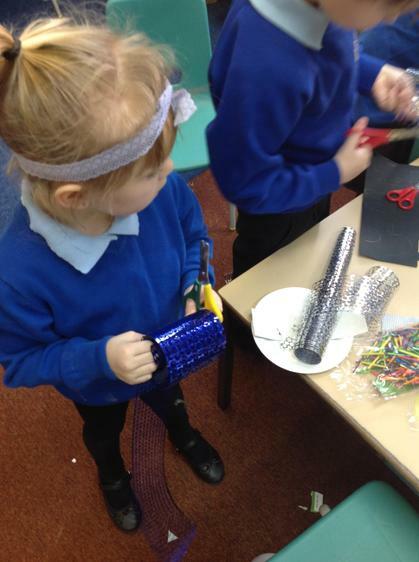 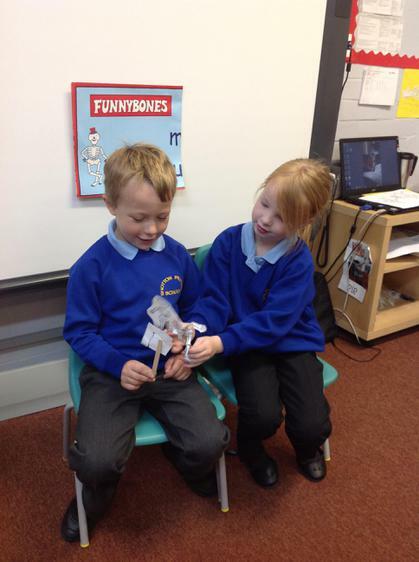 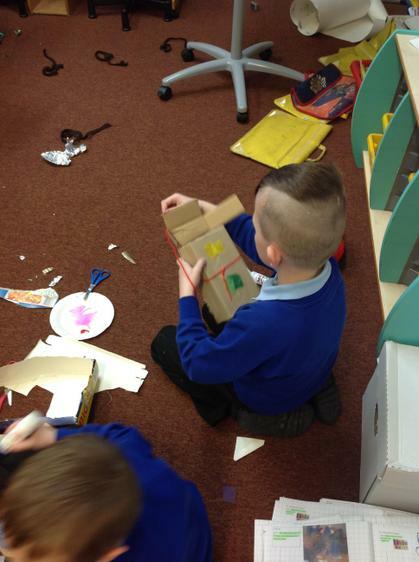 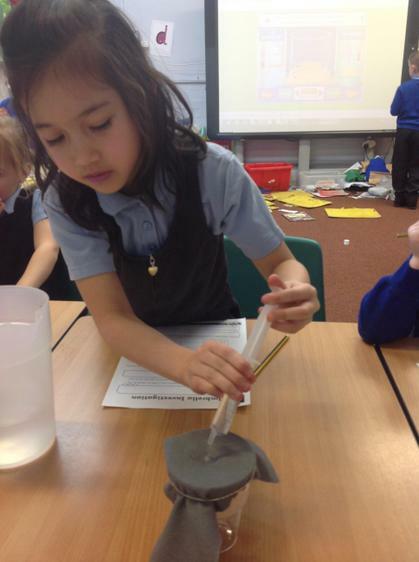 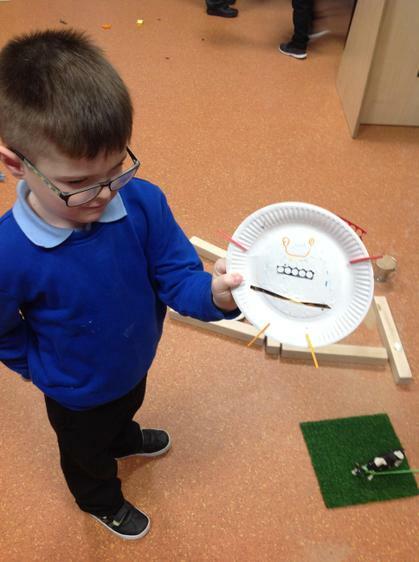 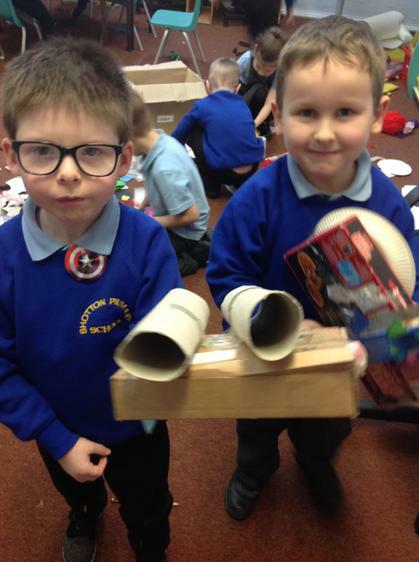 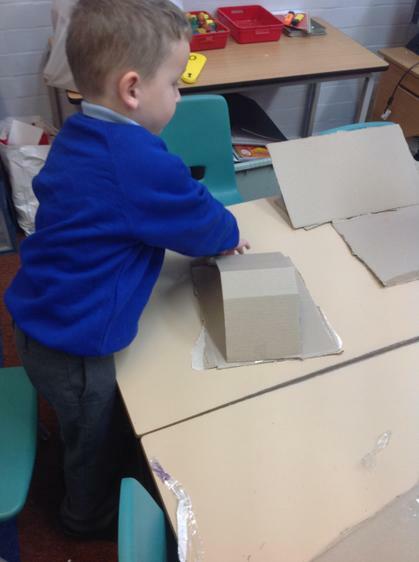 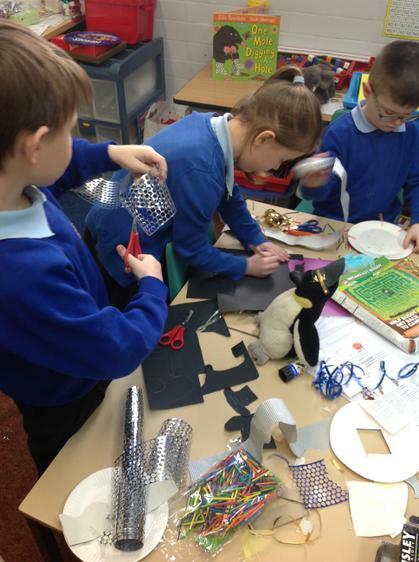 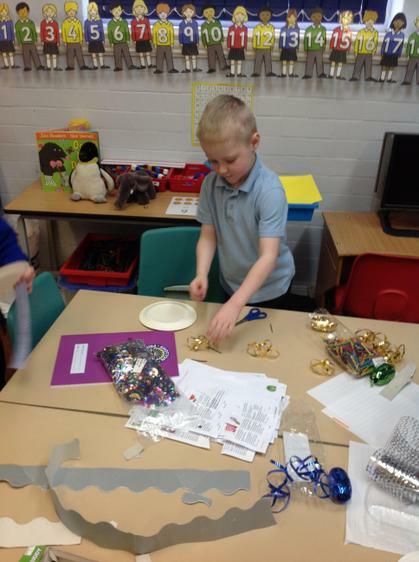 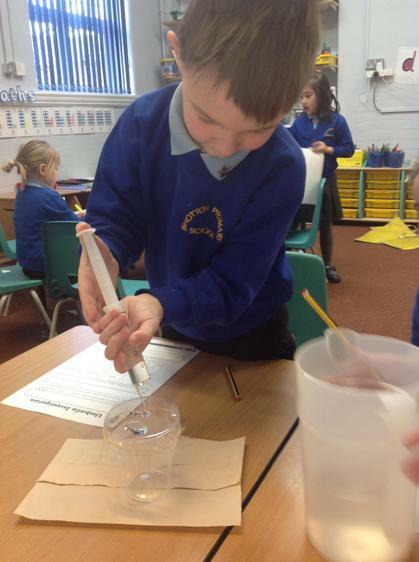 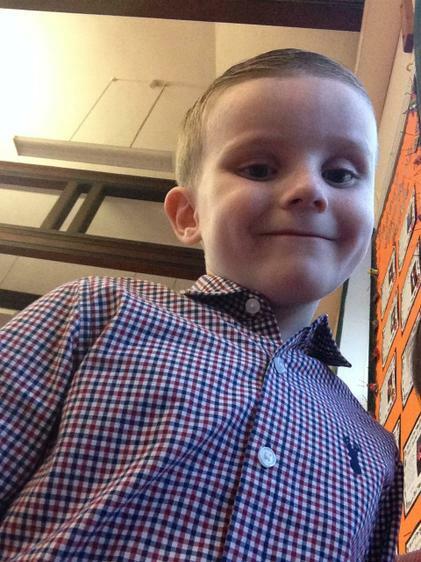 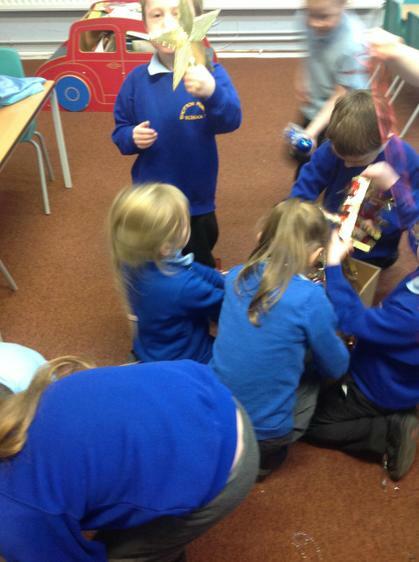 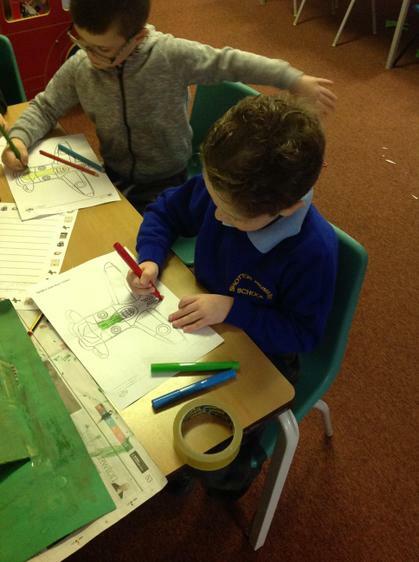 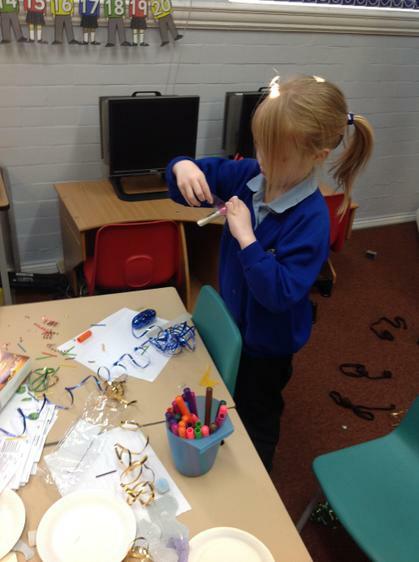 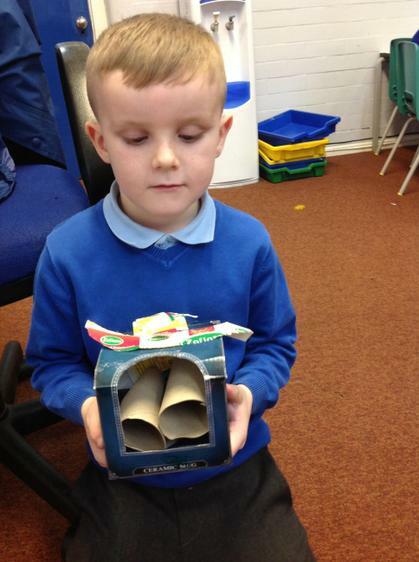 This term in science we have been learning all about materials. 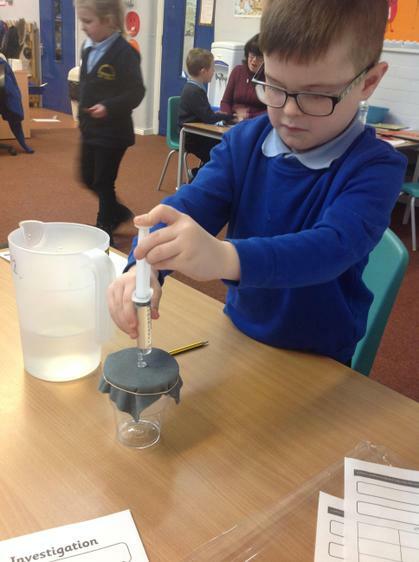 We have explored the properties of lots of different materials and learned why certain materials are used for different purposes. 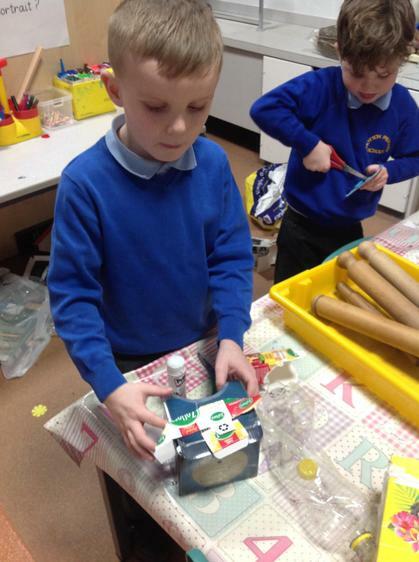 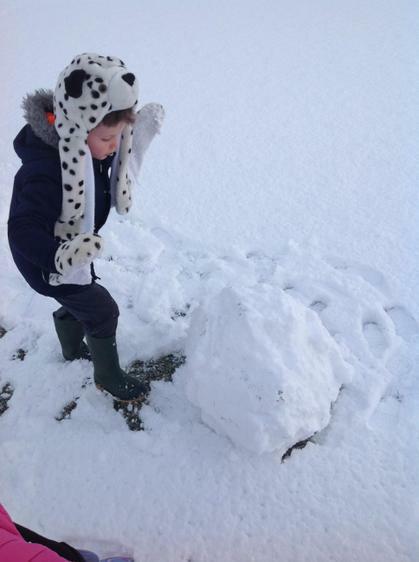 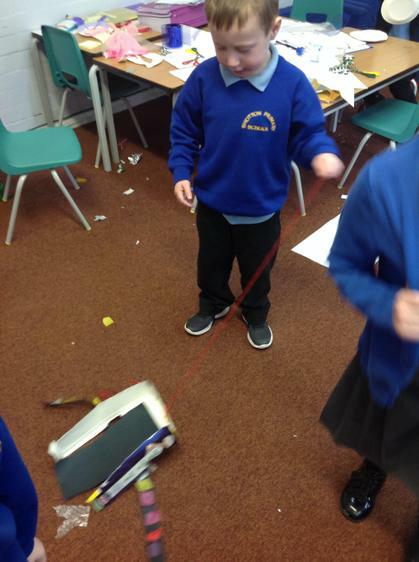 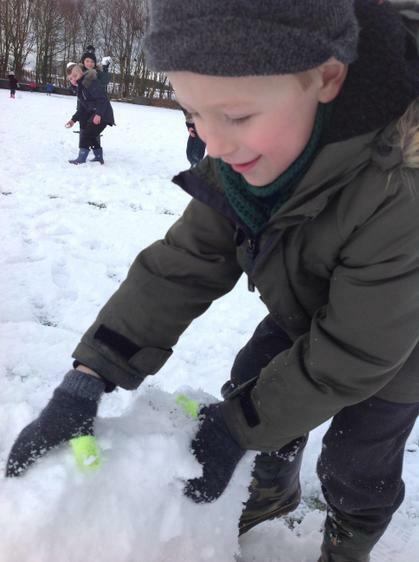 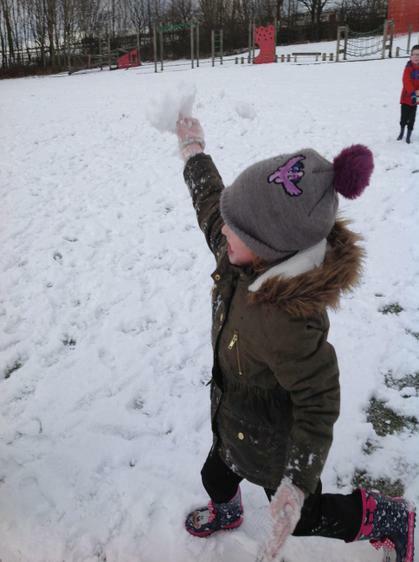 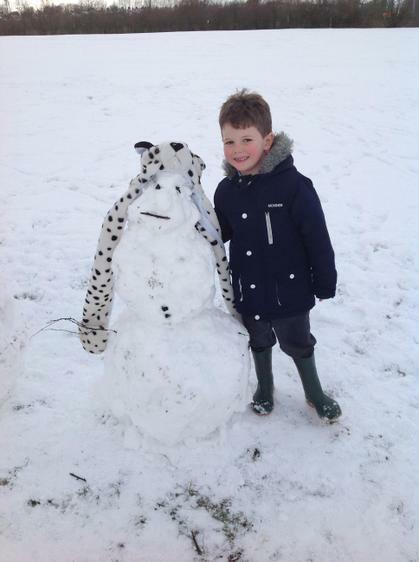 We made lots of different things and also tested various materials for strength, flexibility and to see if they are waterproof. 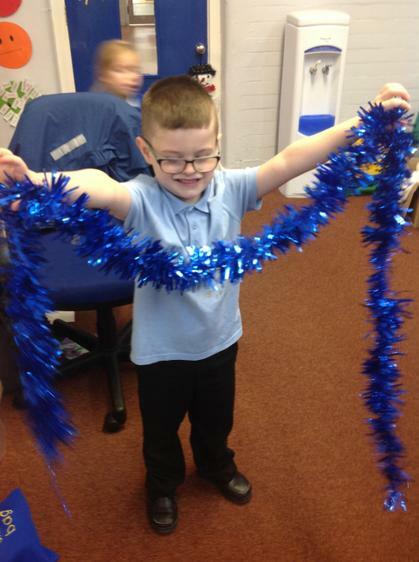 We hope you have a lovely Christmas and a Happy New Year! 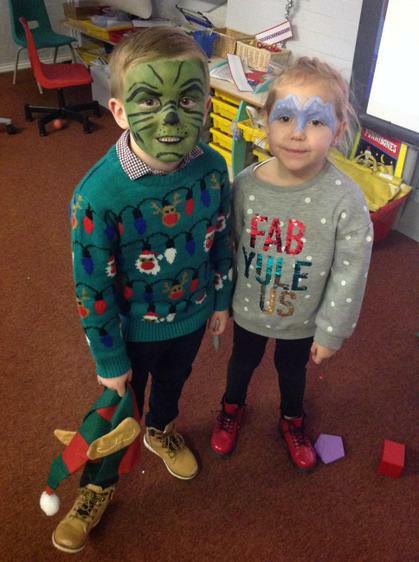 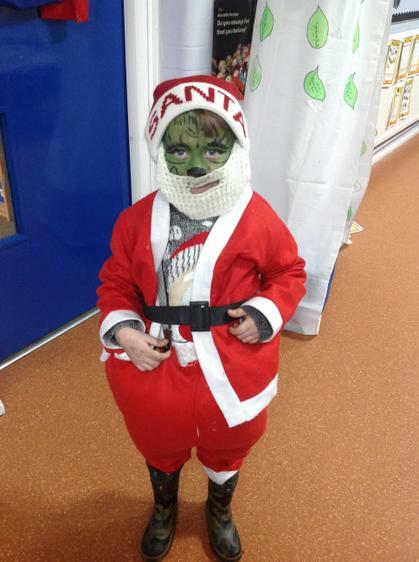 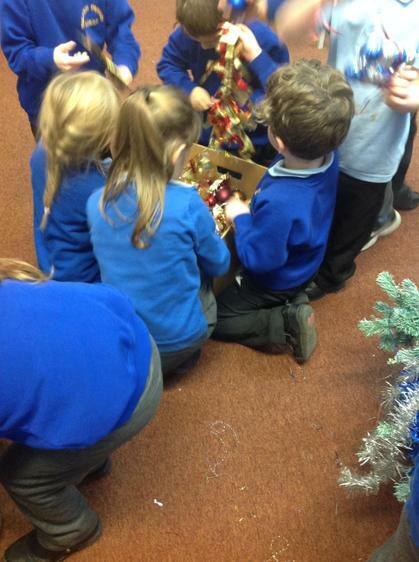 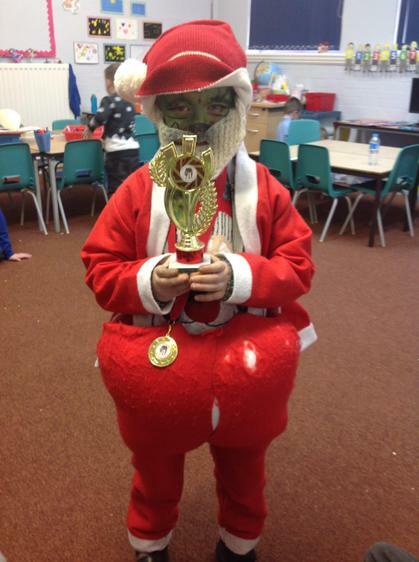 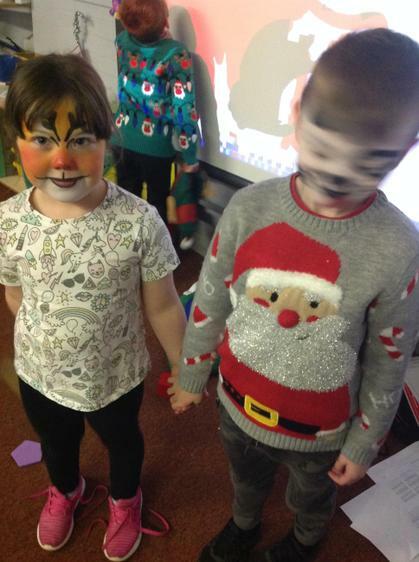 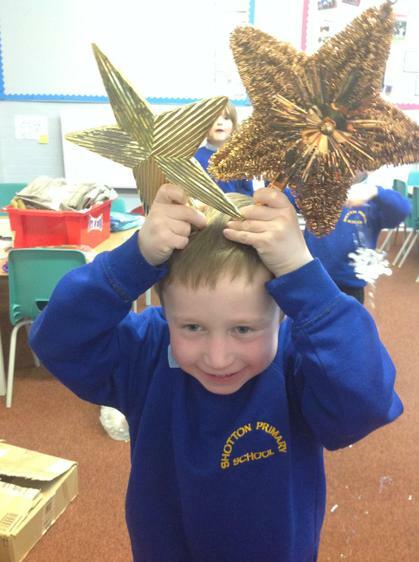 Christmas has well and truly begun in 1C and we have been having lots of festive fun! 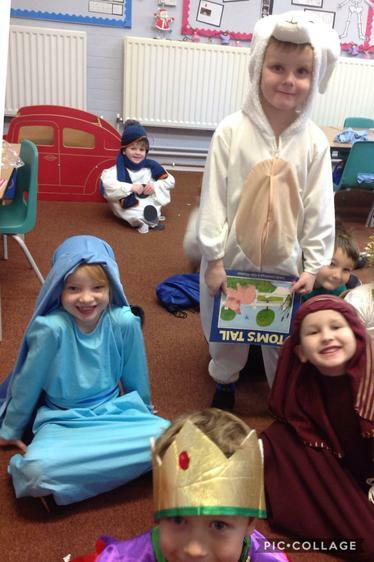 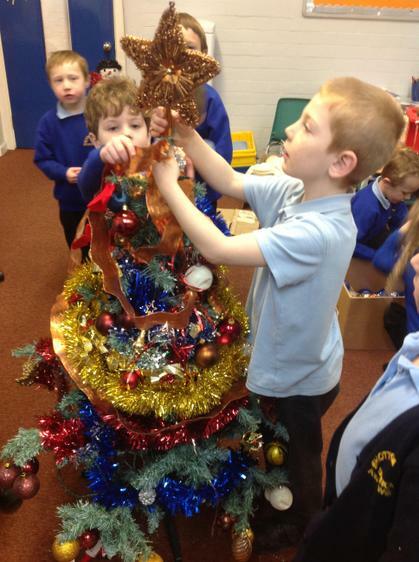 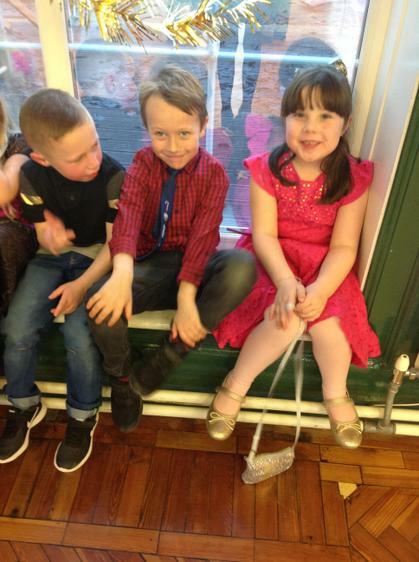 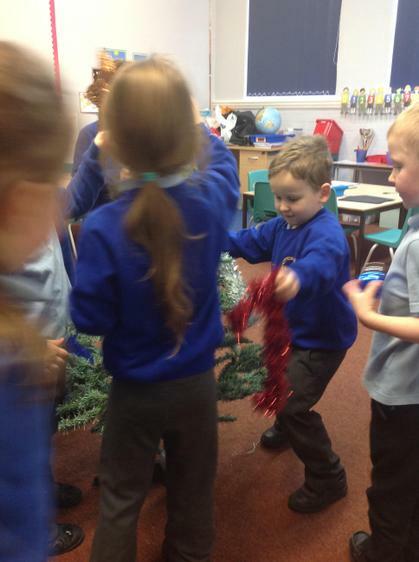 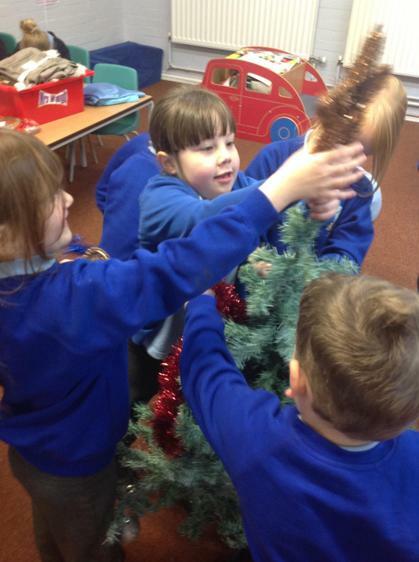 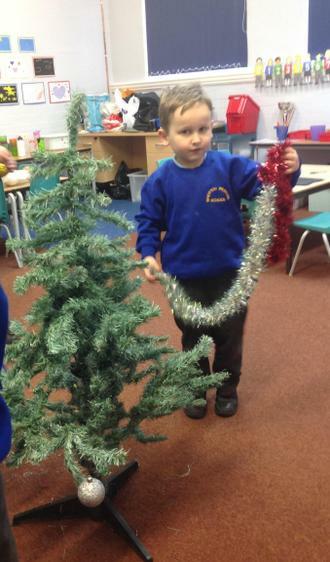 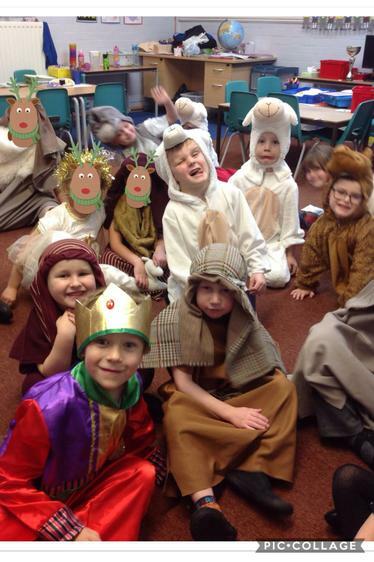 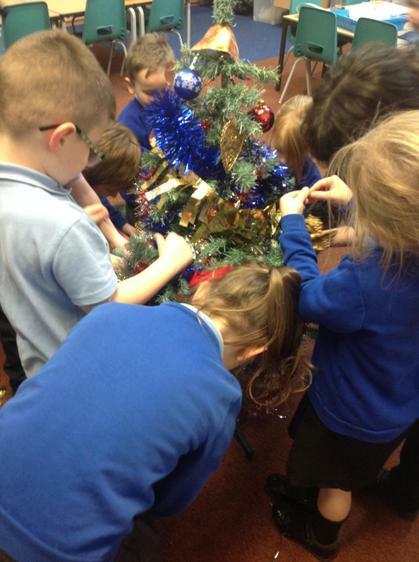 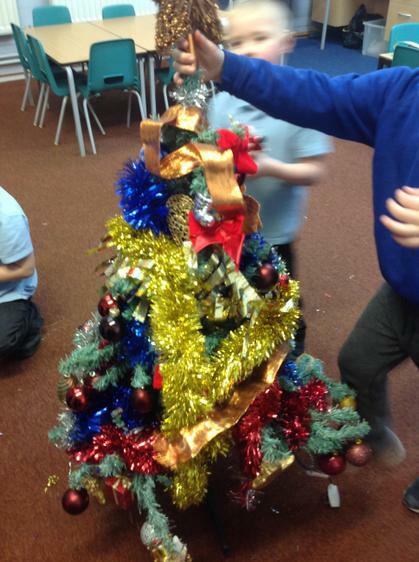 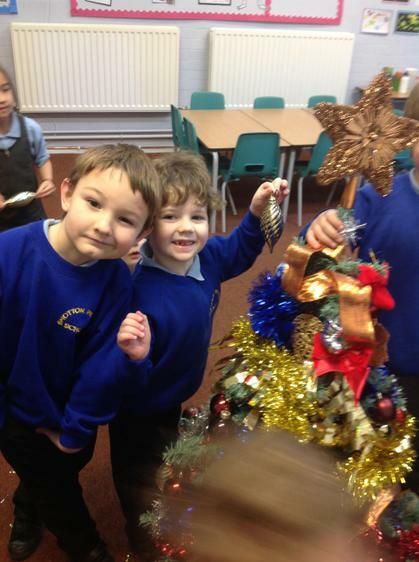 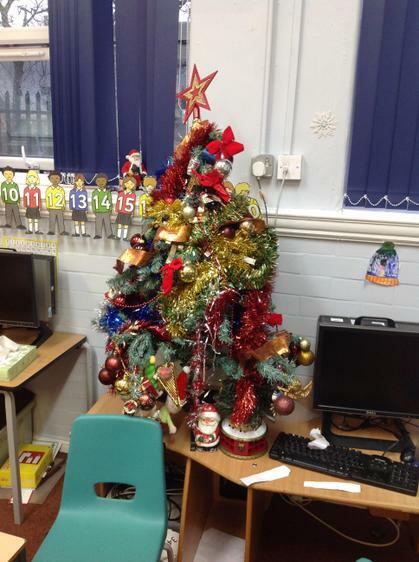 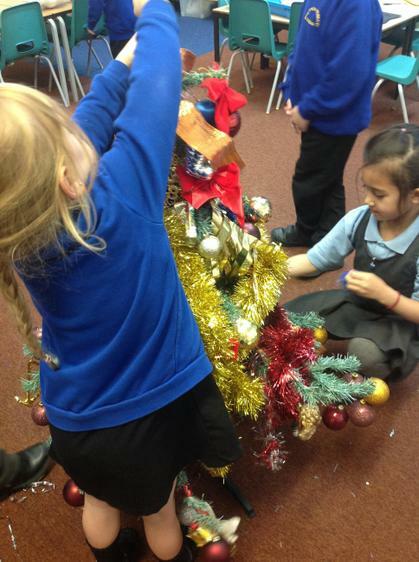 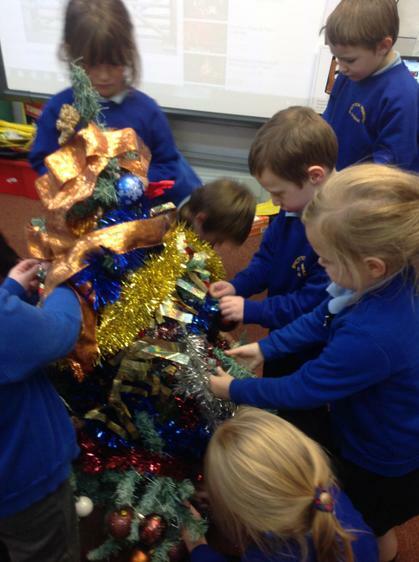 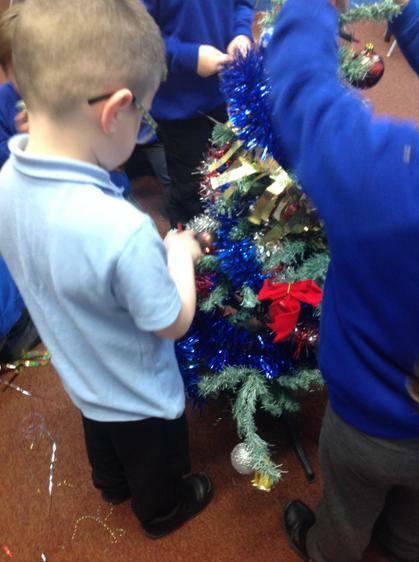 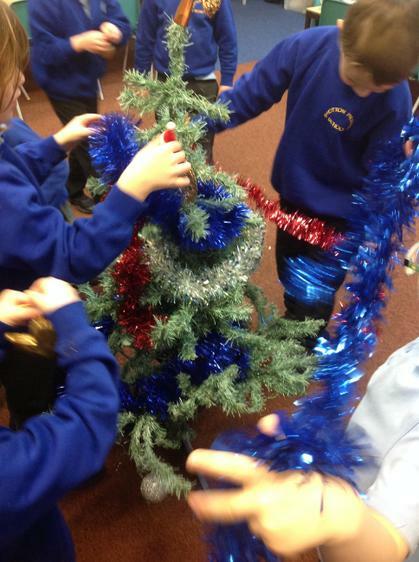 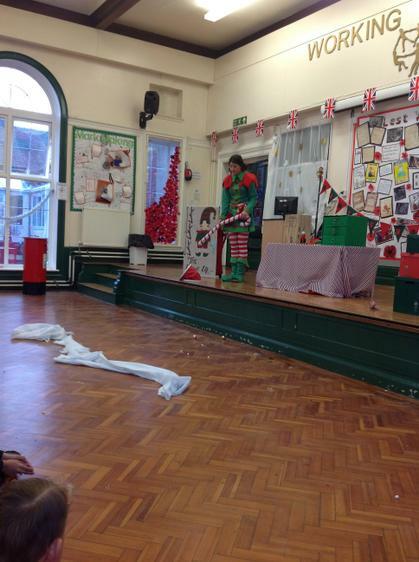 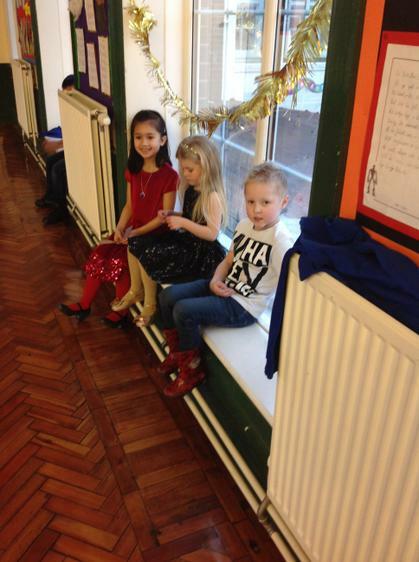 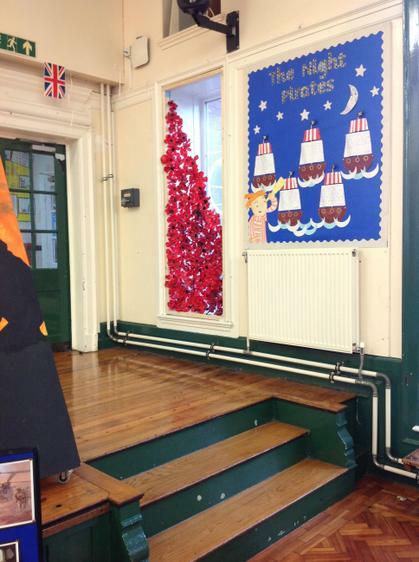 We have put up our very tasteful Christmas tree, performed our nativity play and we really enjoyed our Christmas party. 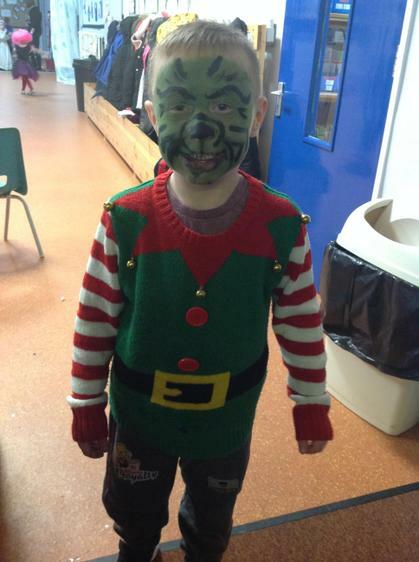 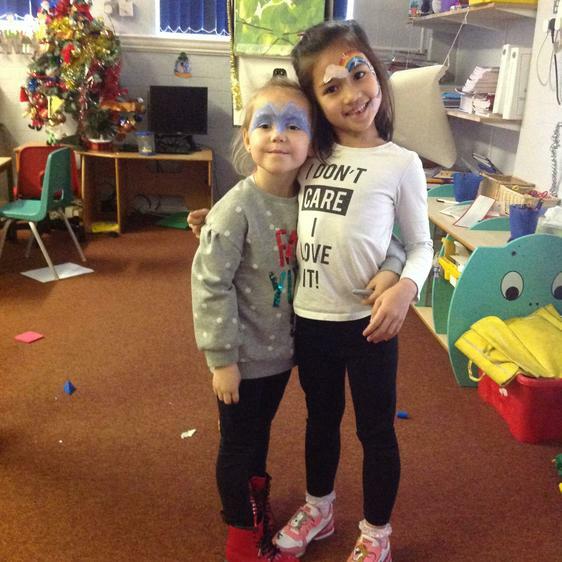 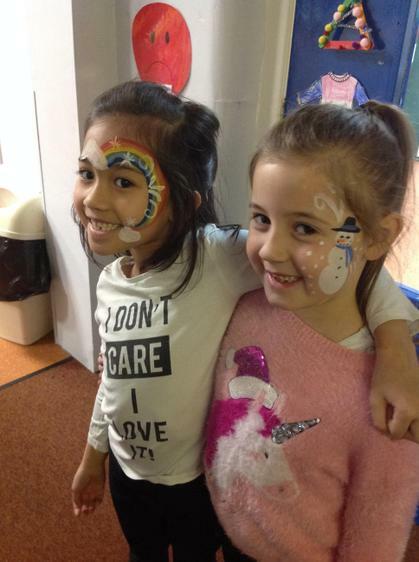 We still have lots to look forward to though as we have a pantomime, Christmas jumper day, Christmas dinner and the Christmas fayre still to come! 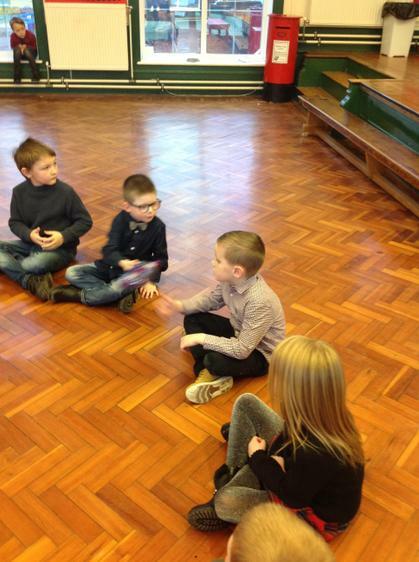 Well done to Layla, Harry, Emily, Jessica, Jake and Parker for earning our termly behaviour reward this term. 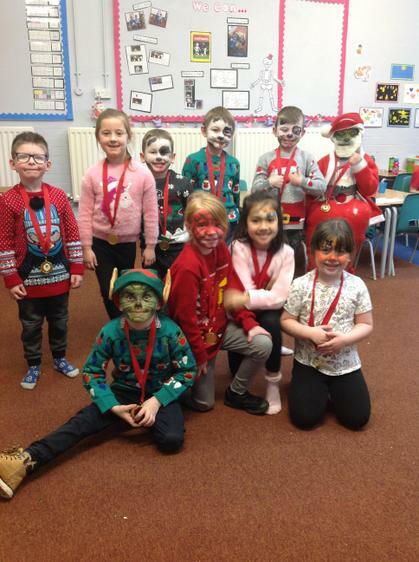 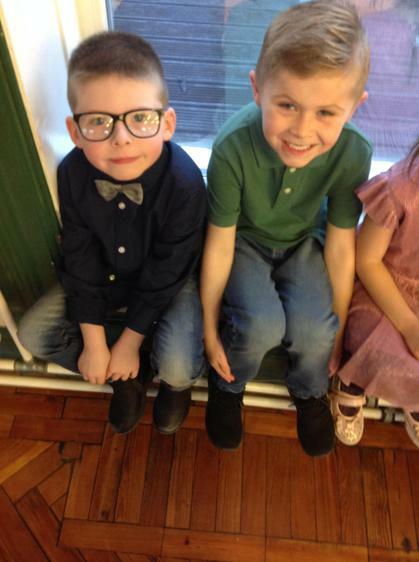 It was a very tough choice but these children were chosen due to their consistently exemplary behaviour and positive attitude towards learning. 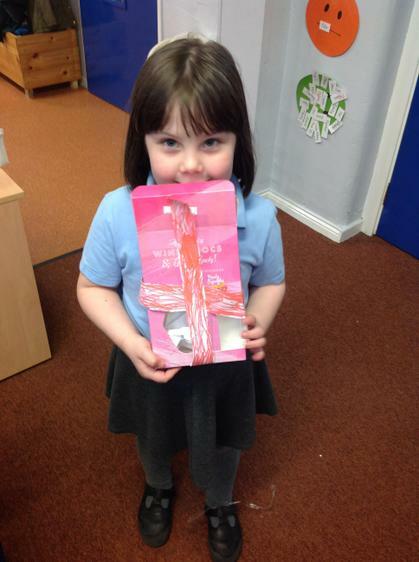 I hope you all enjoy your treat next week, it is very well deserved 😁. 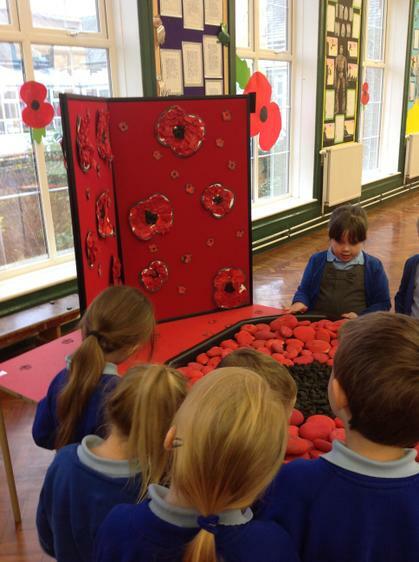 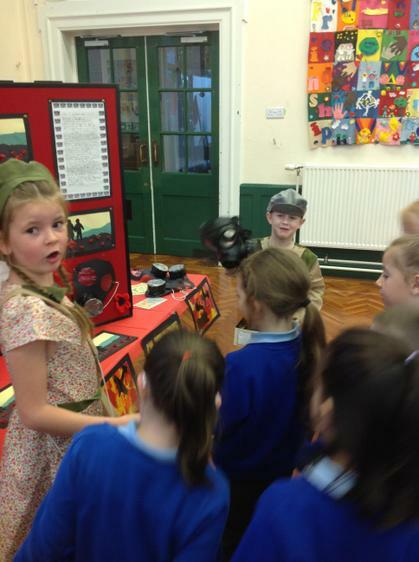 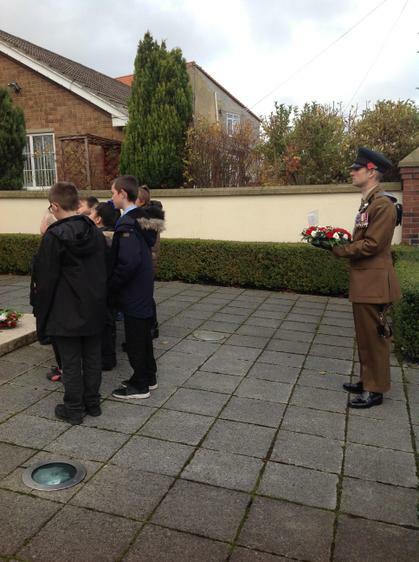 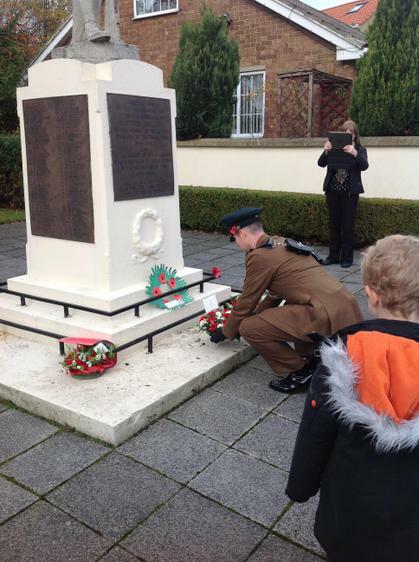 To mark the 100 year anniversary of the end of World War 1 our school held a full week of remembrance, learning about our country's history and those who sacrificed their lives in the world wars. 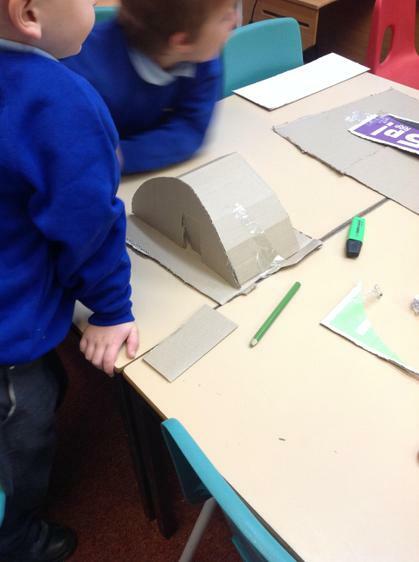 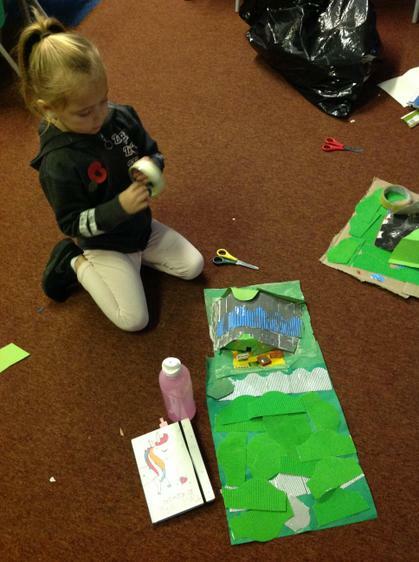 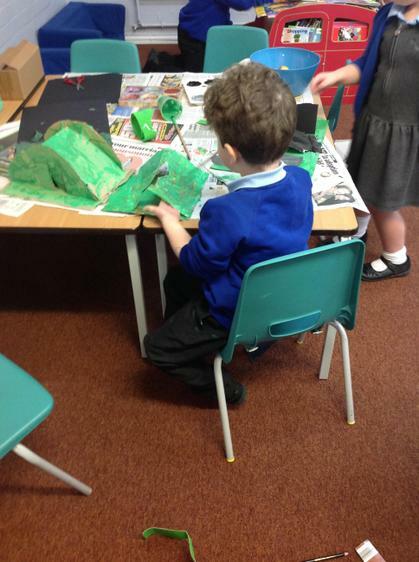 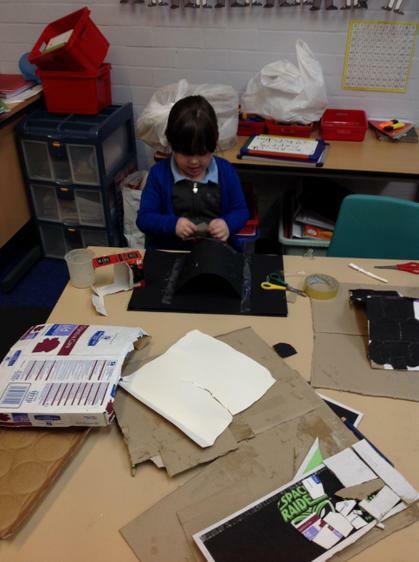 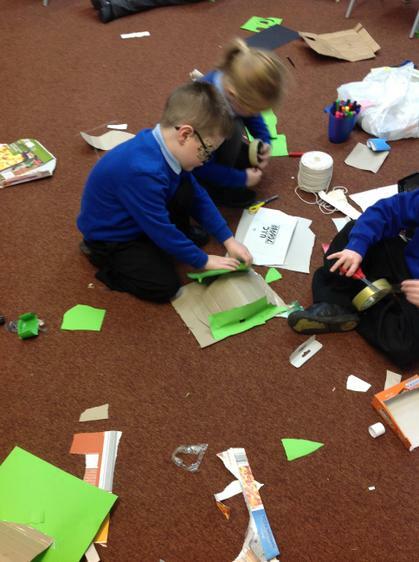 Our class focussed on the war at home and our task was to learn about and make model Anderson shelters for the exhibition. 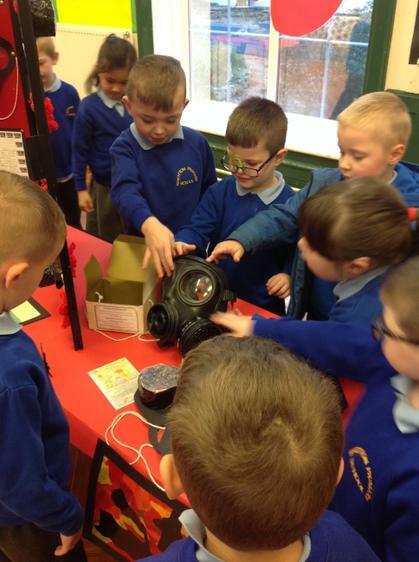 The children were very engaged with the subject and throughout the week we ended up learning so much more about our history and the wars than just Anderson shelters, such was the children's eagerness to find out more. 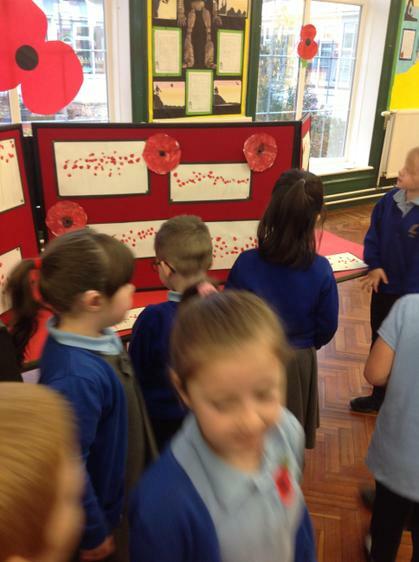 The children really learned a deeper understanding of why we have Remembrance Day and we all agreed how lucky we are to live in peace time where we are safe. 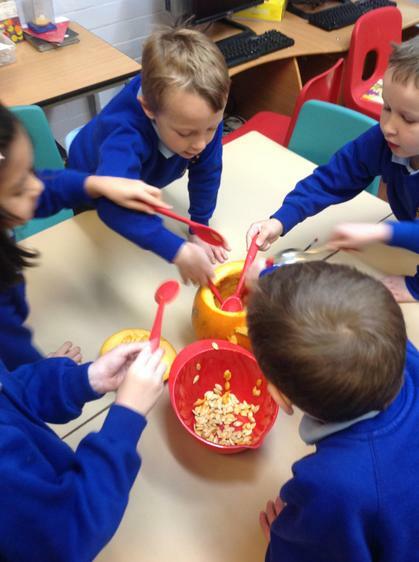 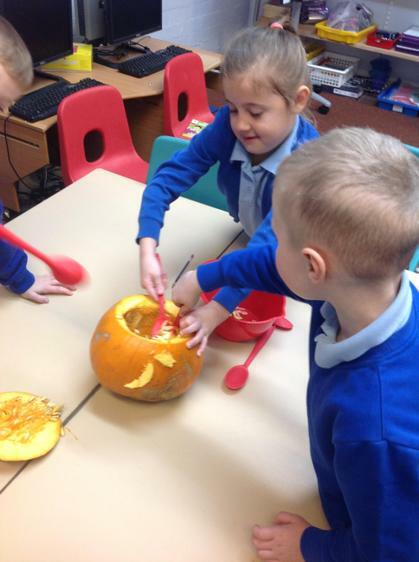 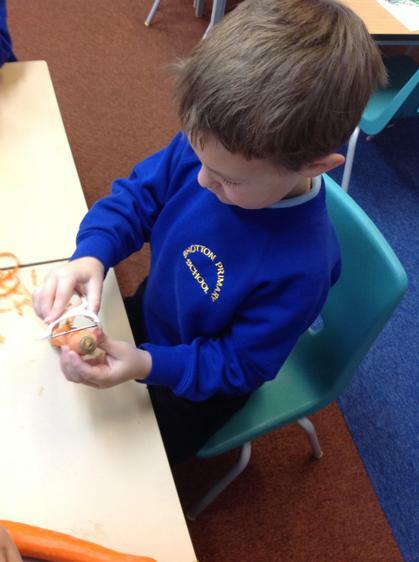 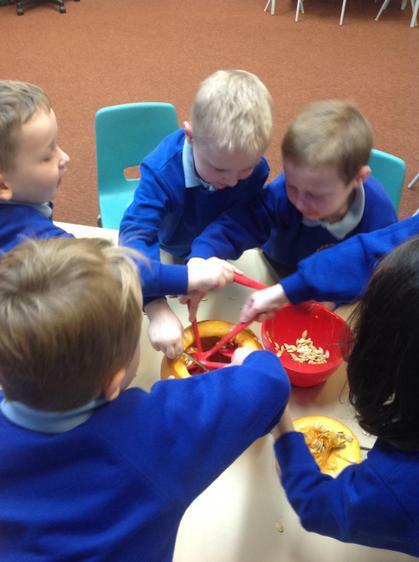 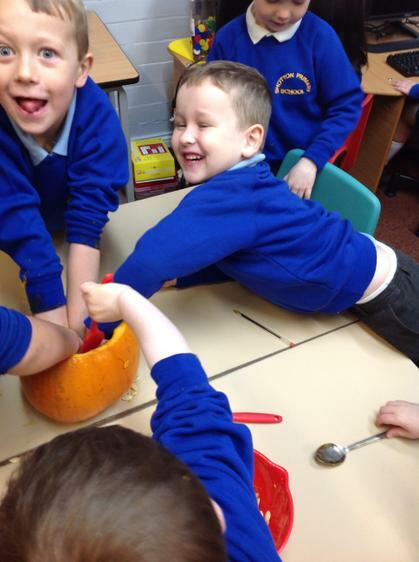 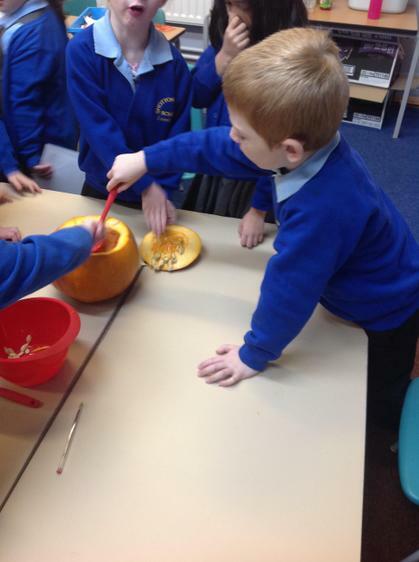 In literacy we have been reading the book 'Pumpkin Soup' by Helen Cooper and what better time to make pumpkin soup than at Halloween! 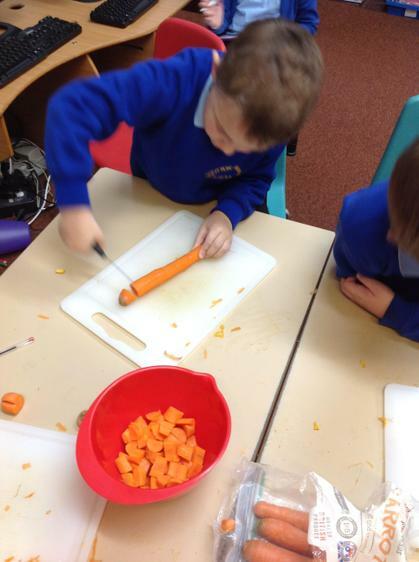 We used the internet to find recipes and also watched a video on YouTube demonstrating how to make the soup. 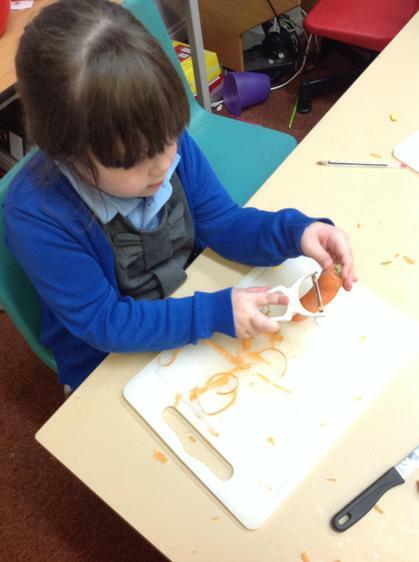 We wrote instructions and what we would need first, then set to work on making the soup. 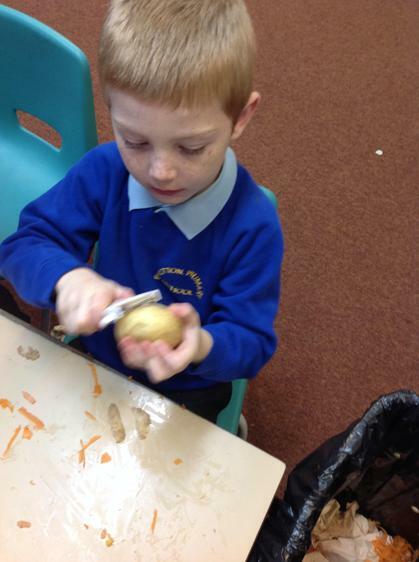 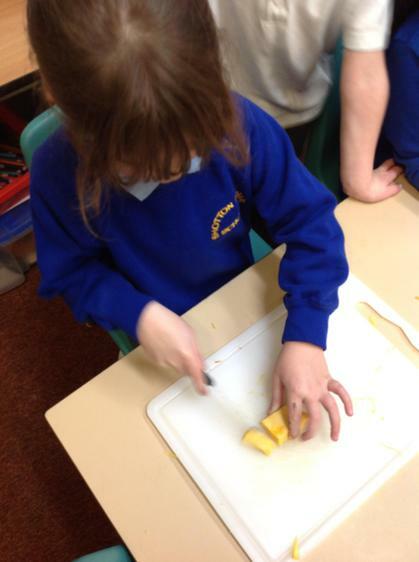 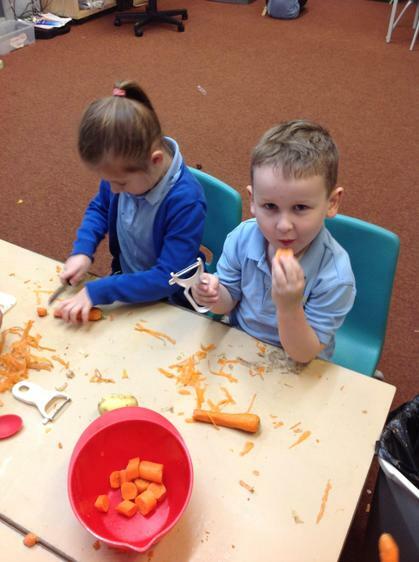 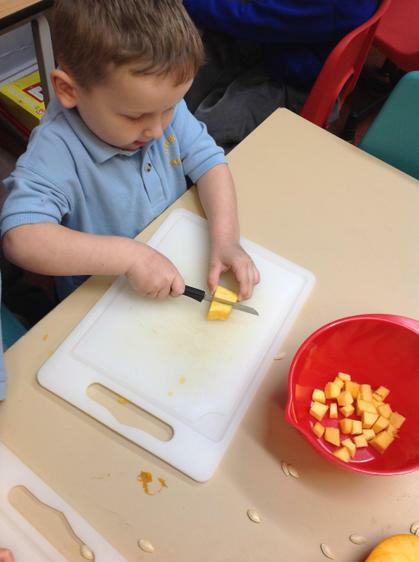 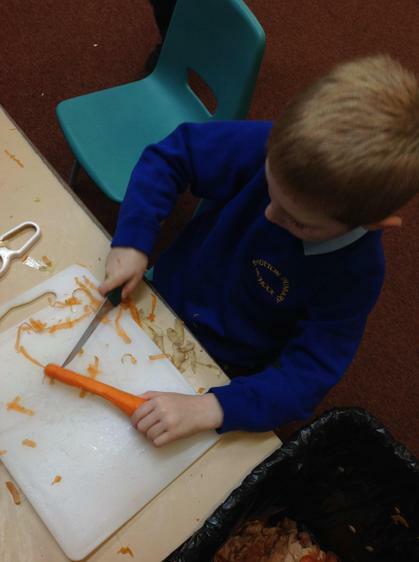 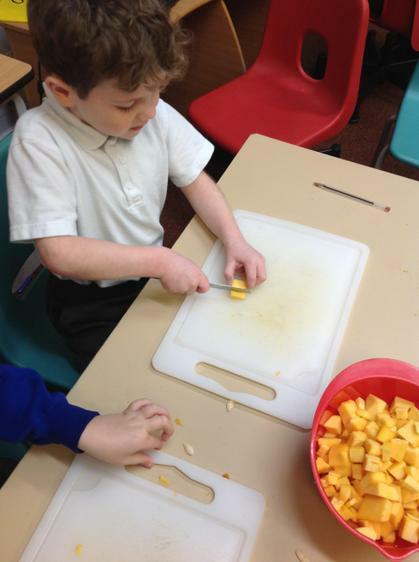 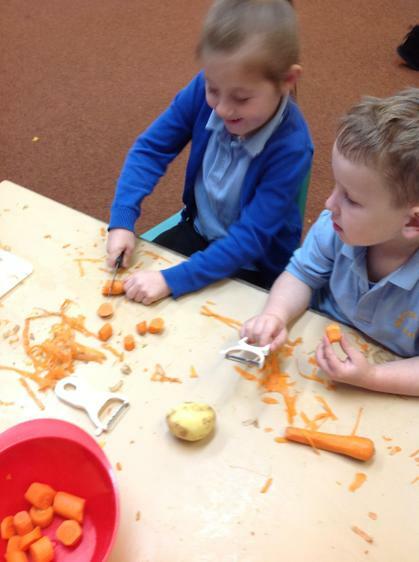 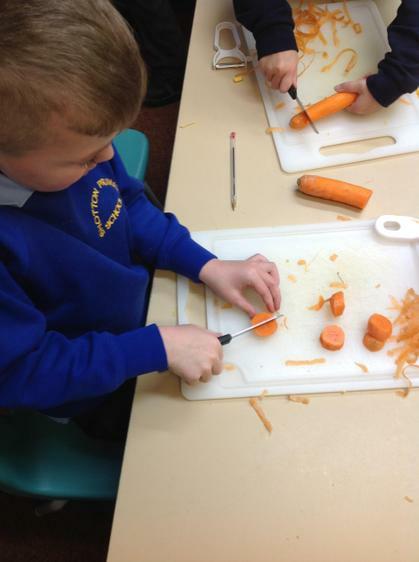 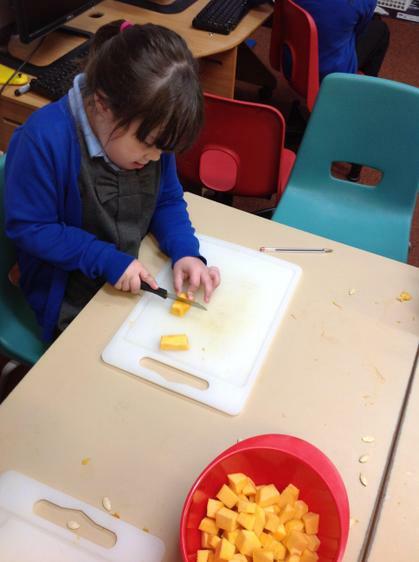 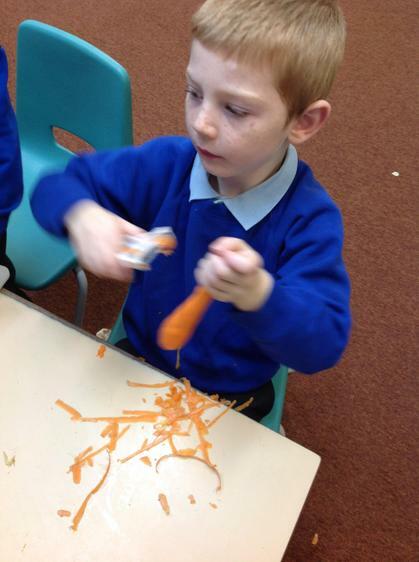 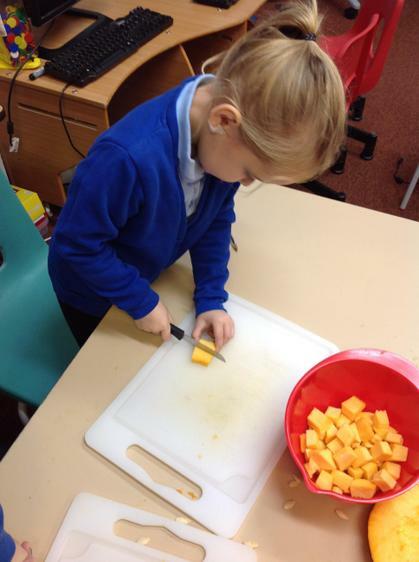 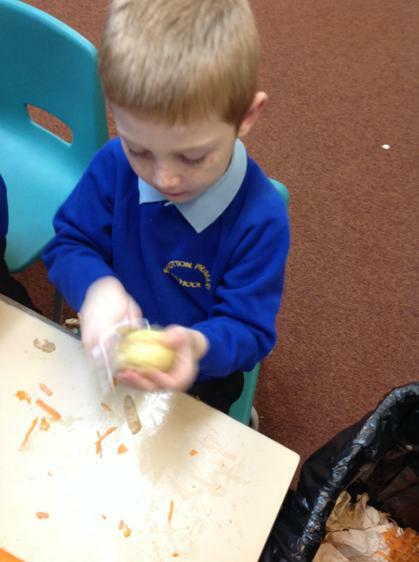 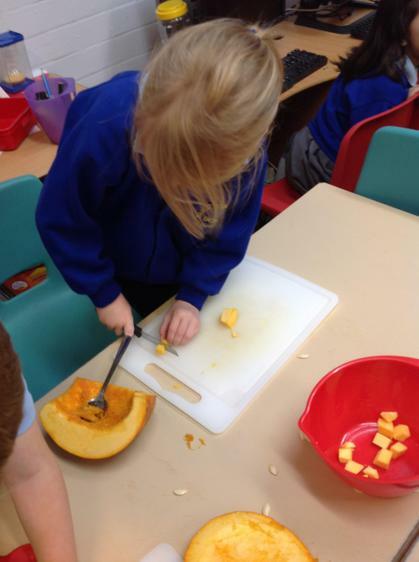 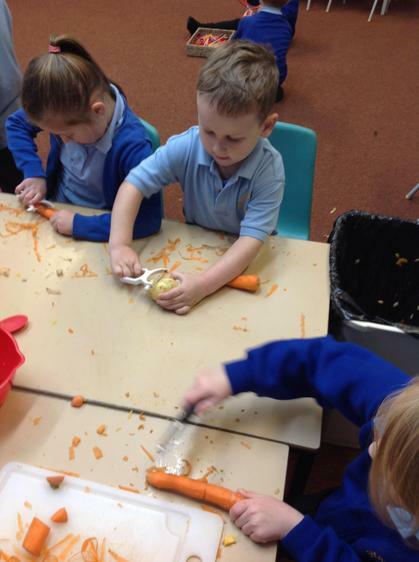 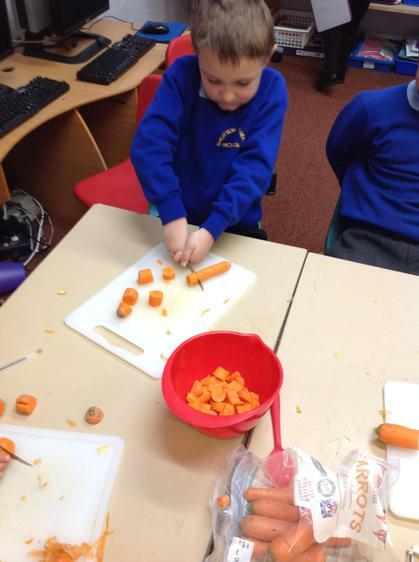 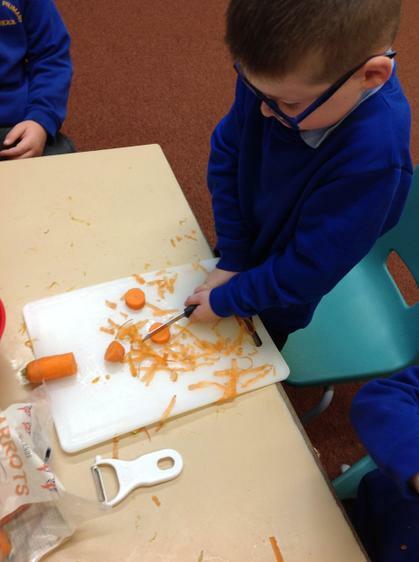 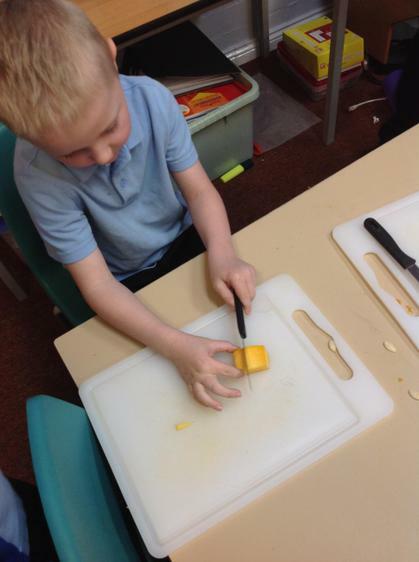 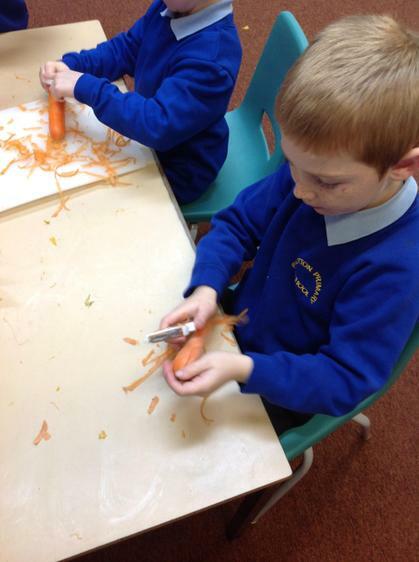 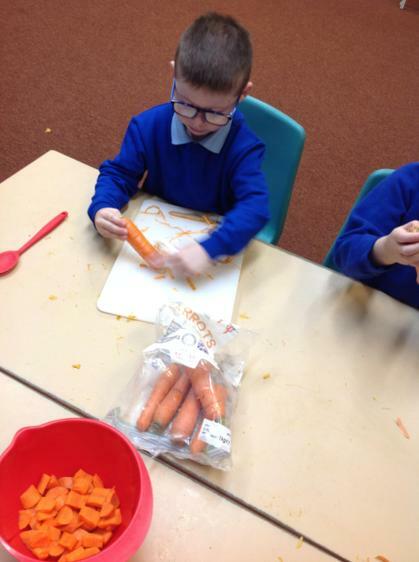 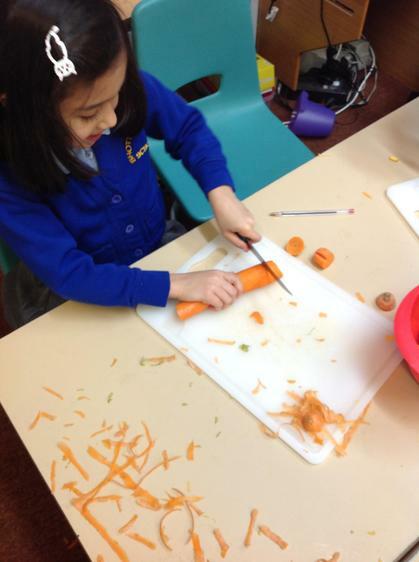 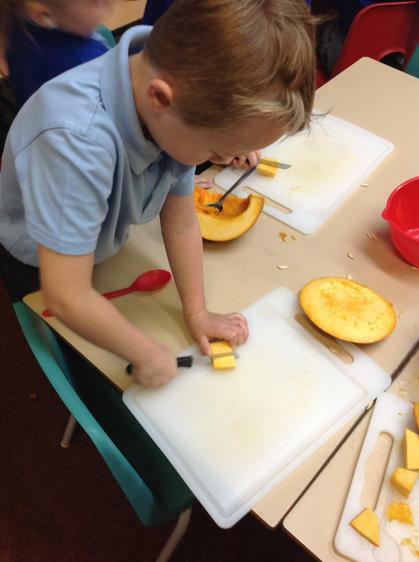 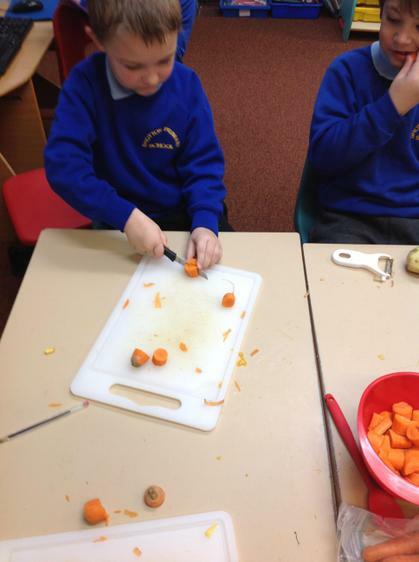 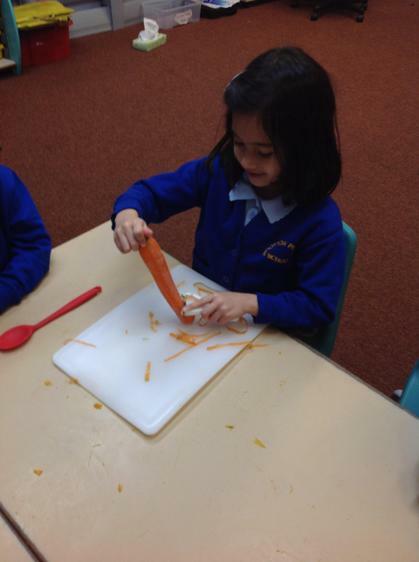 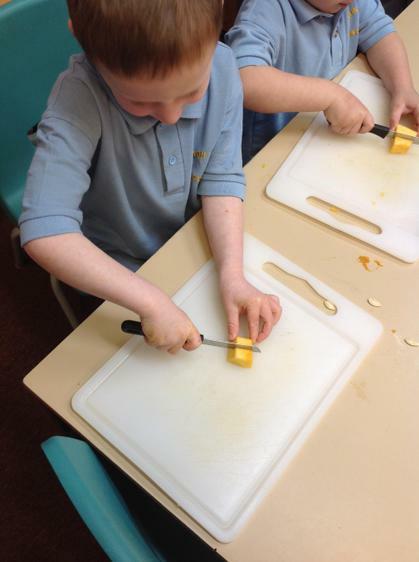 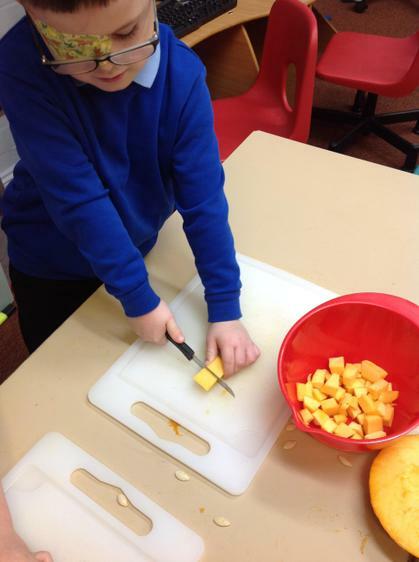 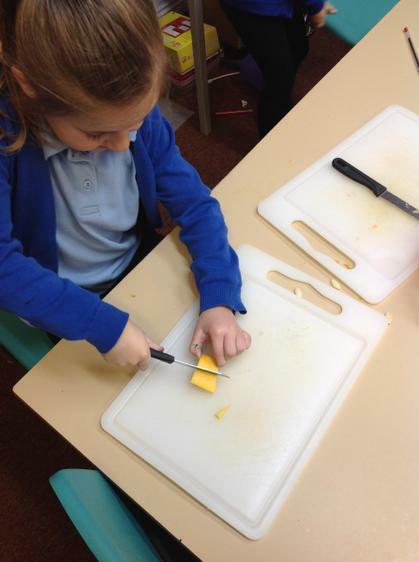 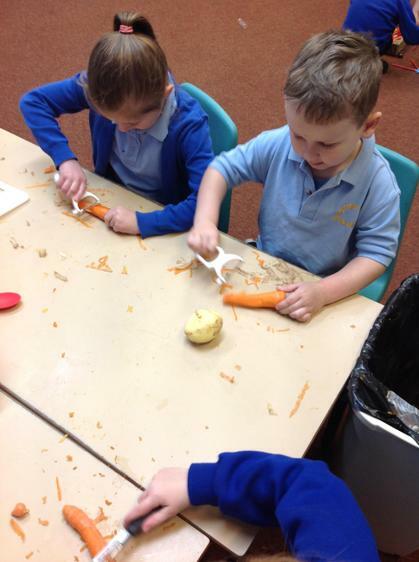 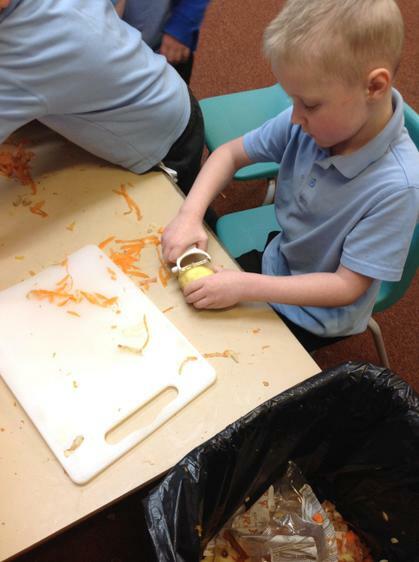 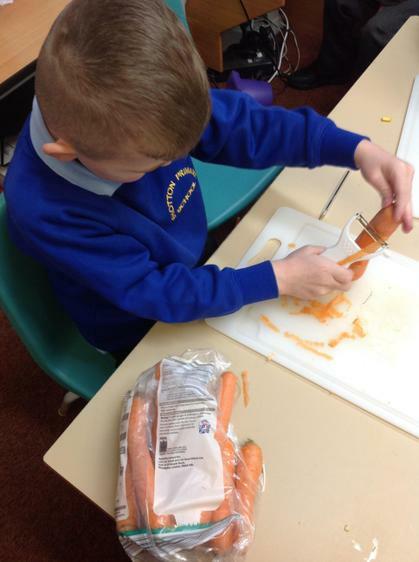 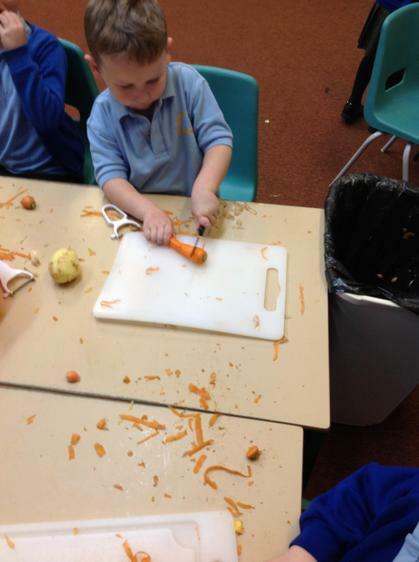 We learned how to safely peel and chop and chop vegetables for our soup and I was really impressed by how sensible and safety conscious the children were when using the sharp knives and peelers. 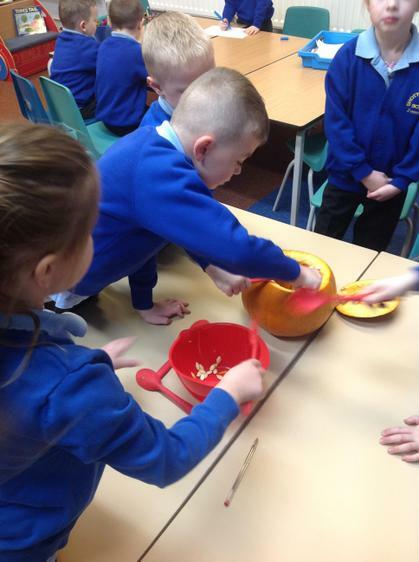 The soup was delicious and most children enjoyed it, although we all agreed next time we would add a little more water to make it less thick! 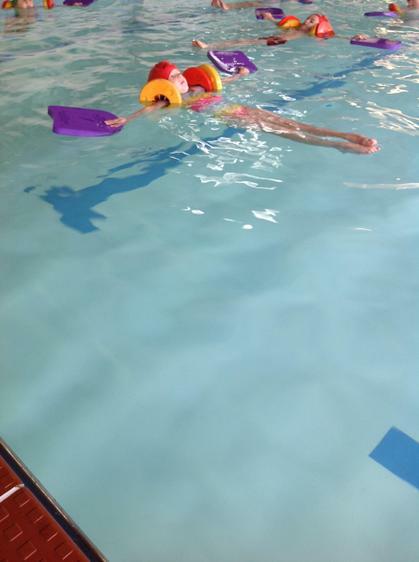 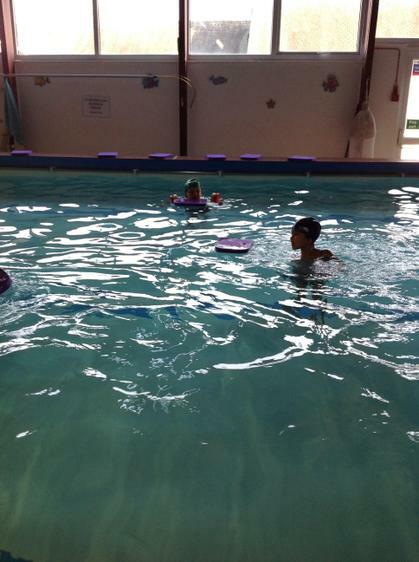 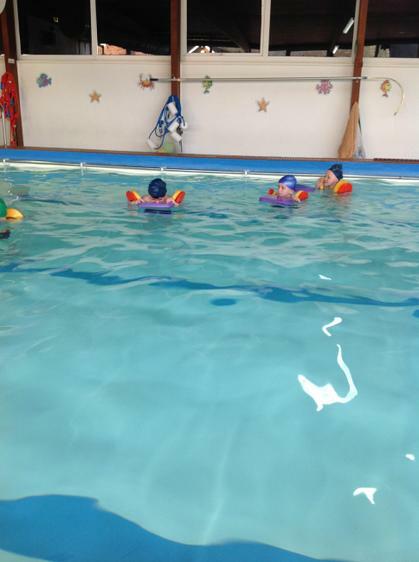 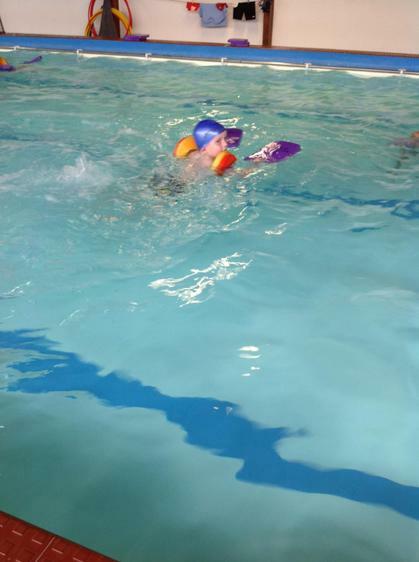 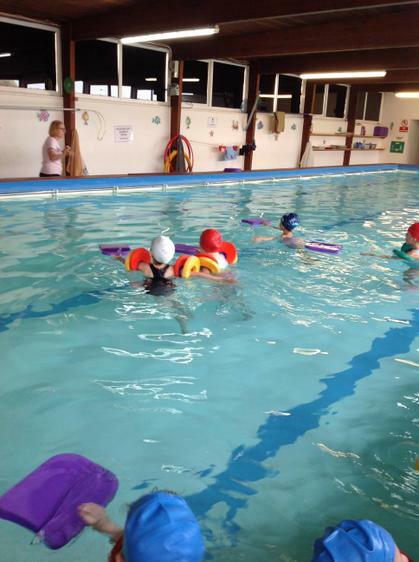 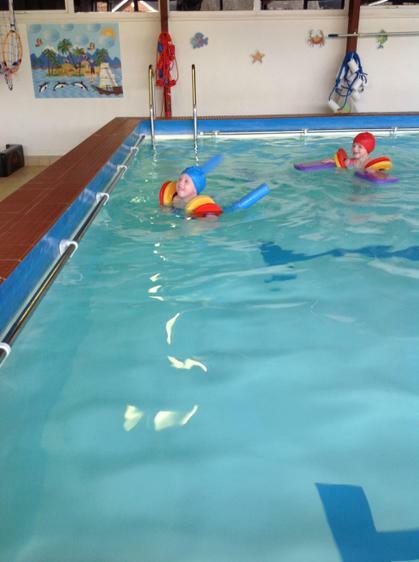 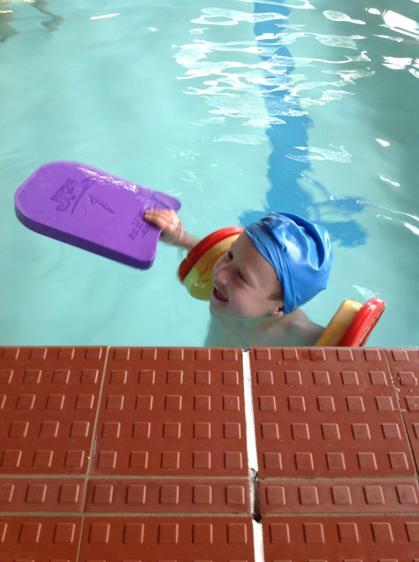 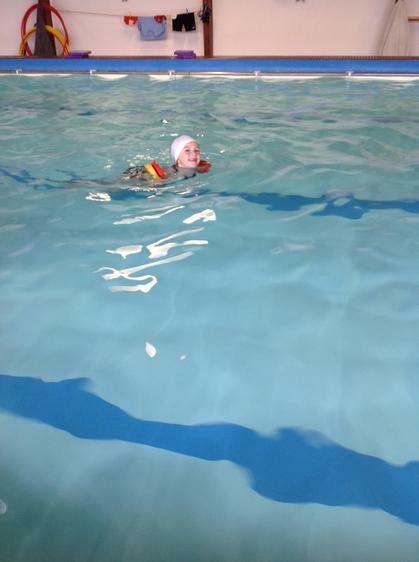 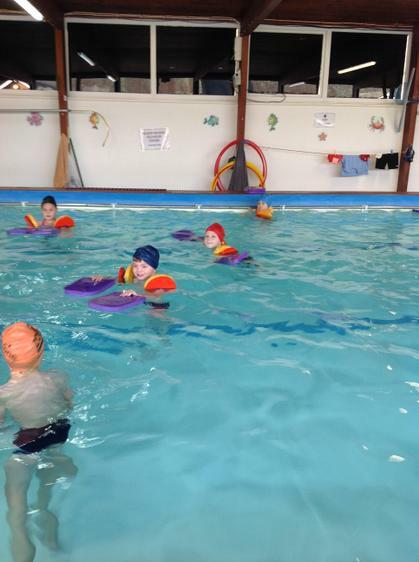 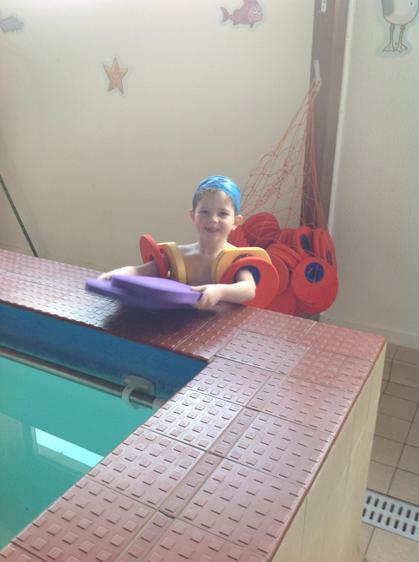 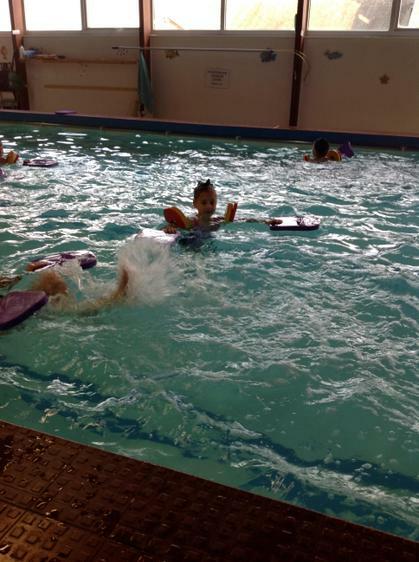 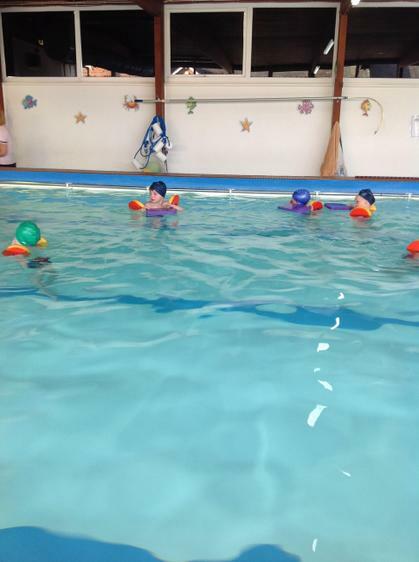 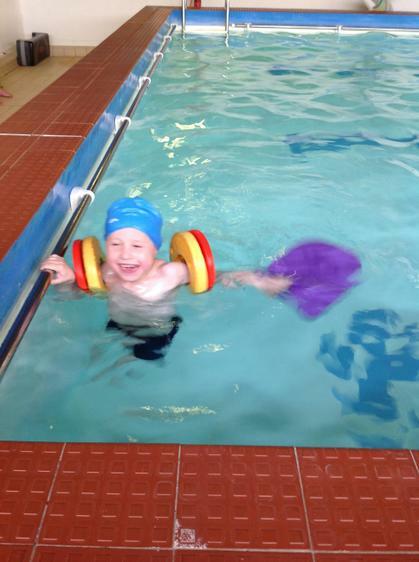 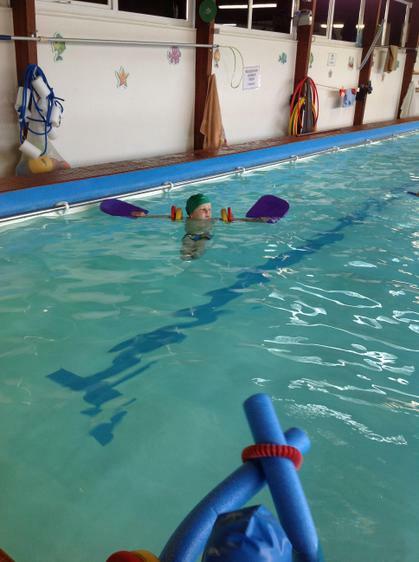 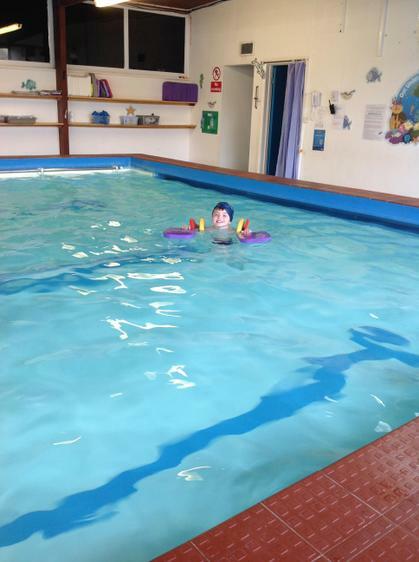 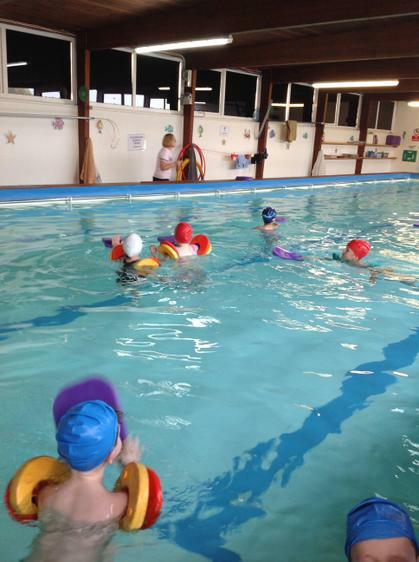 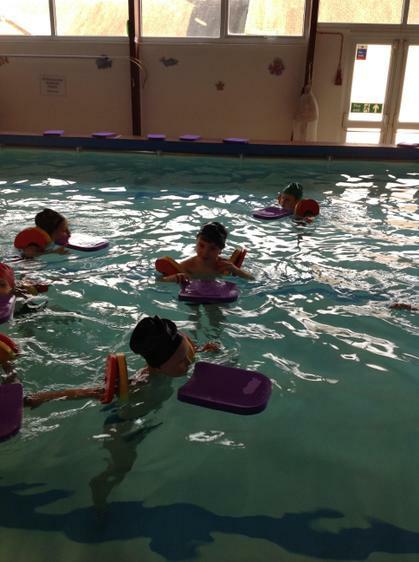 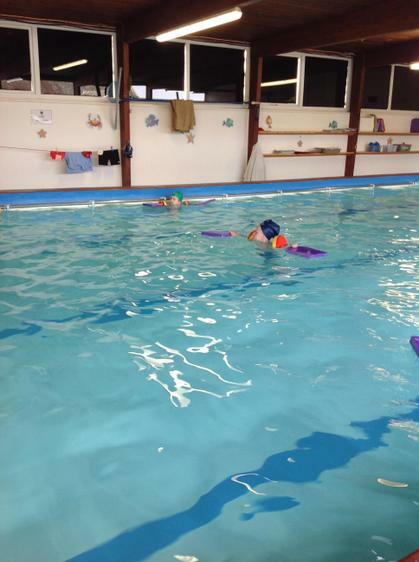 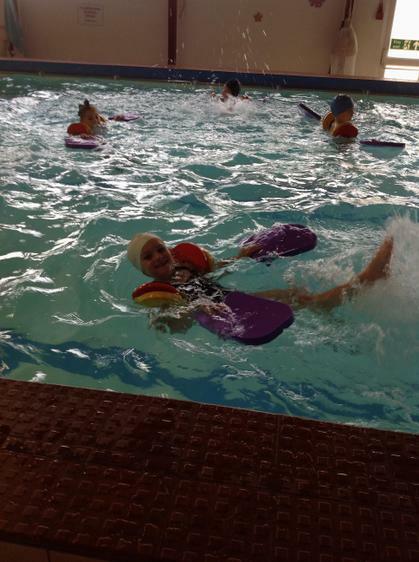 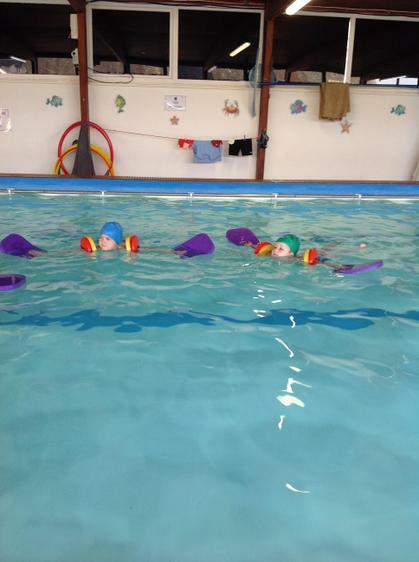 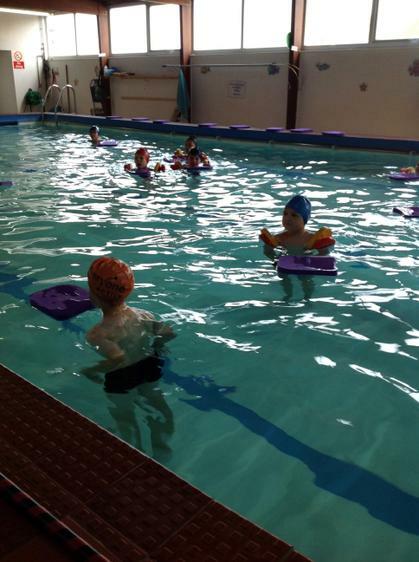 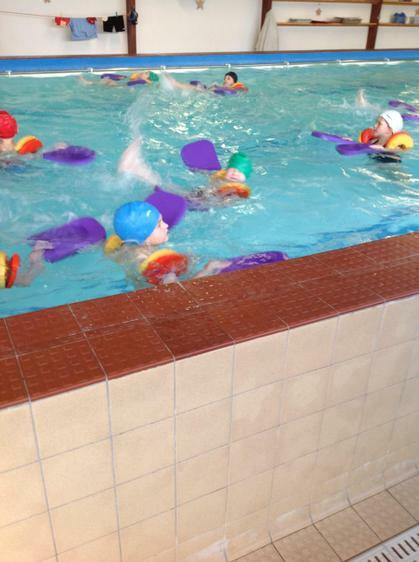 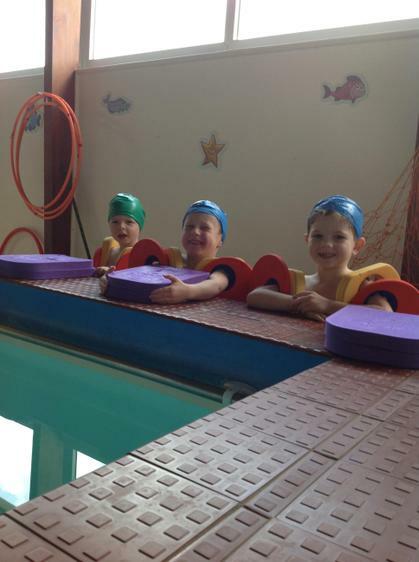 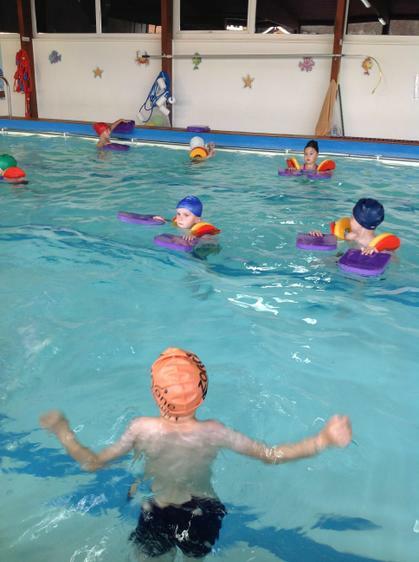 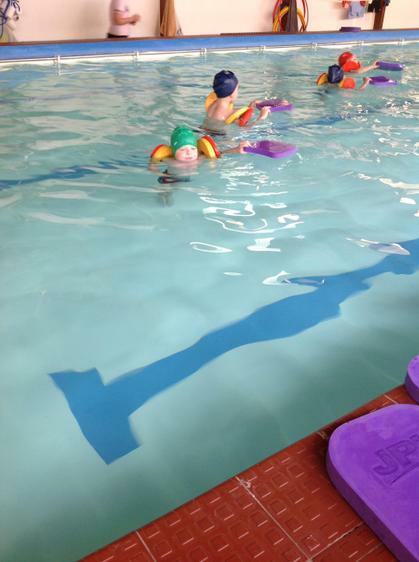 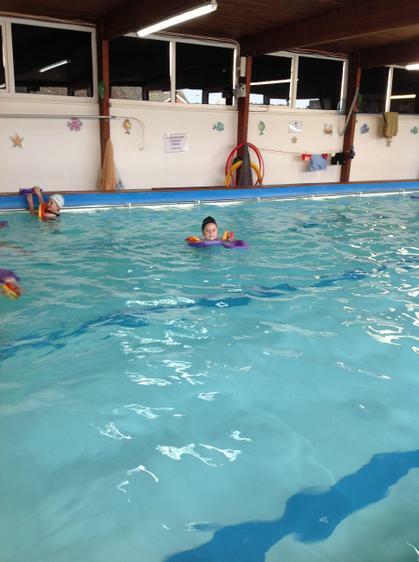 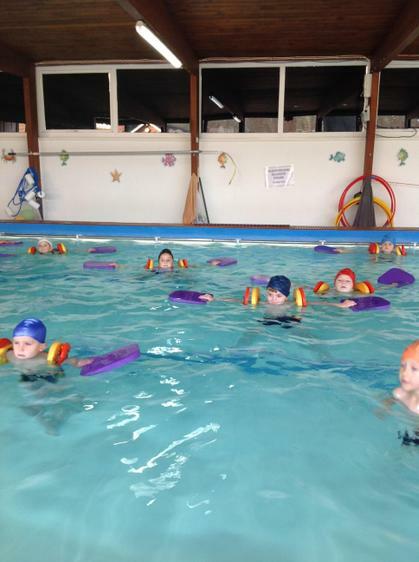 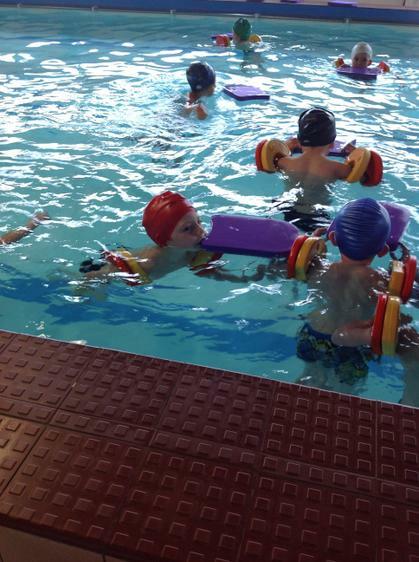 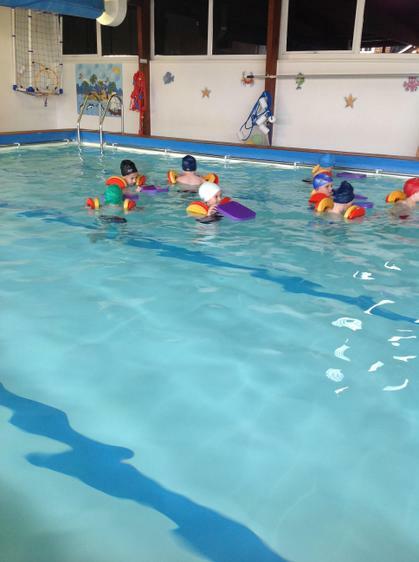 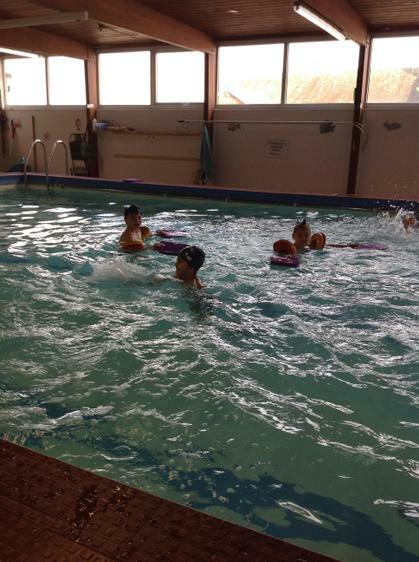 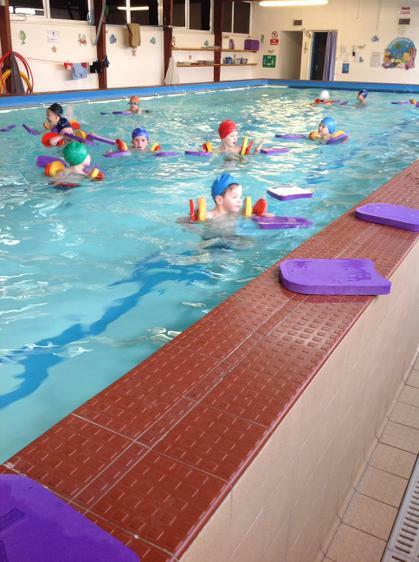 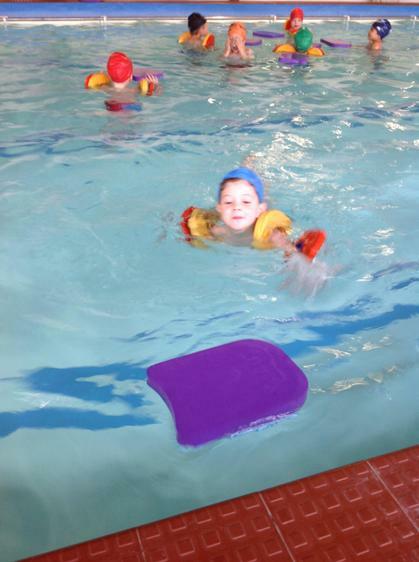 We have really been enjoying our swimming lessons! 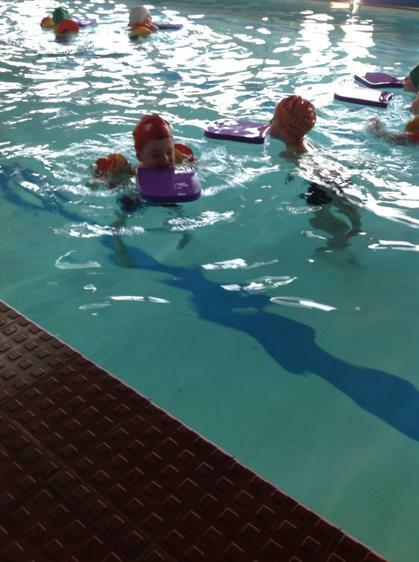 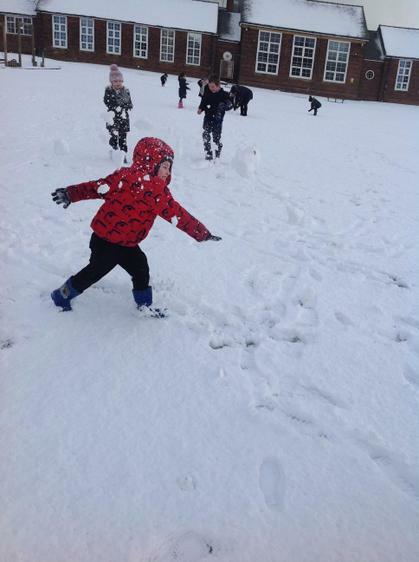 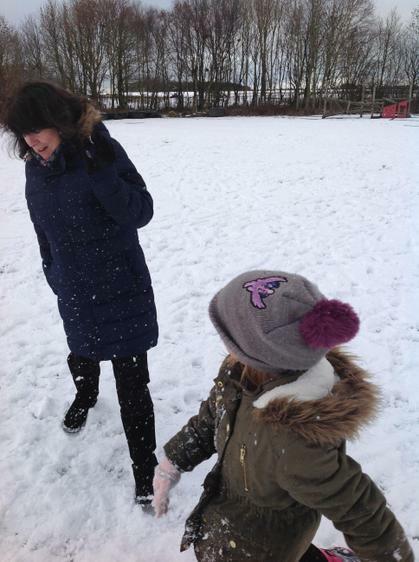 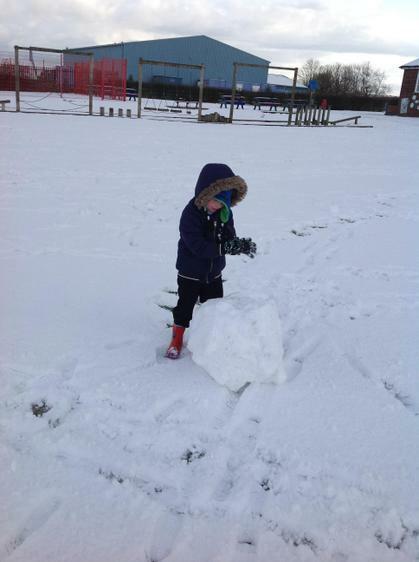 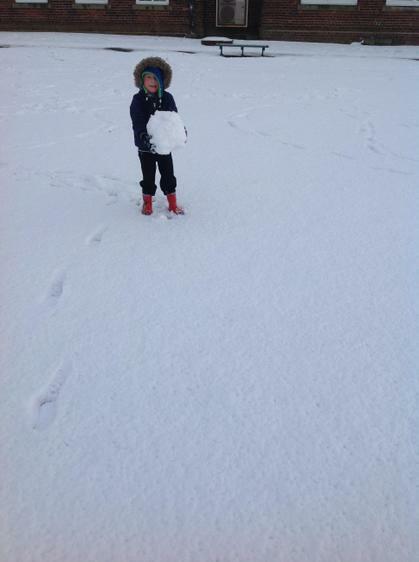 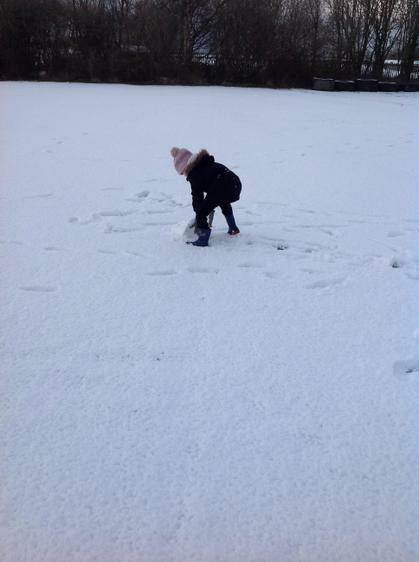 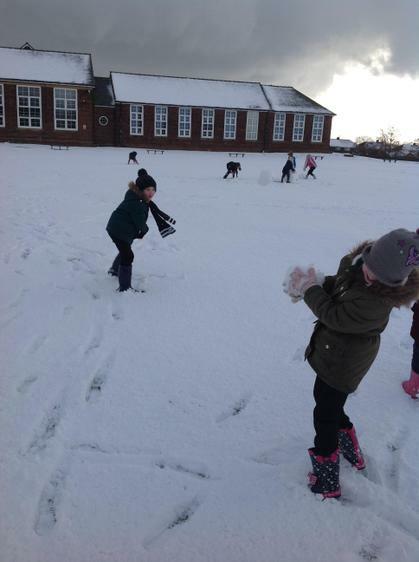 We are very luck at Shotton Primary to have the swimming pool on site and a super swimming teacher, Mrs Evans. 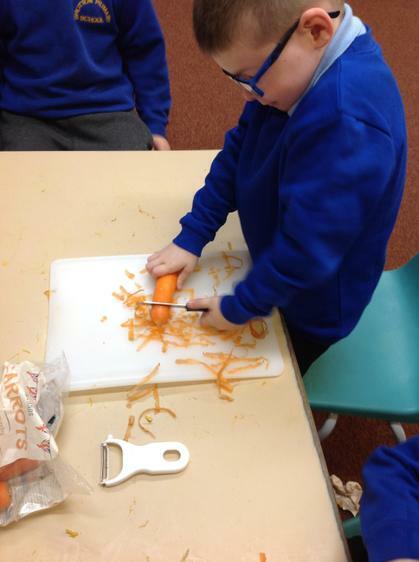 It was lovely to see how the children's confidence has grown since their first lesson and how they are developing their skills. 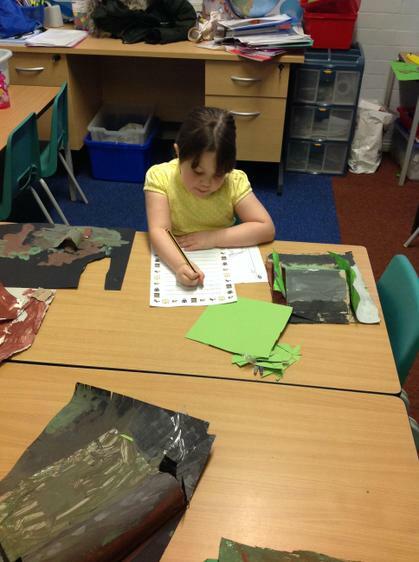 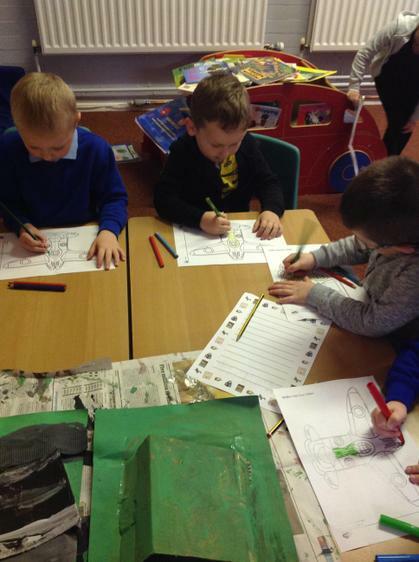 This term in geography we are learning about the United Kingdom and exploring our local area. 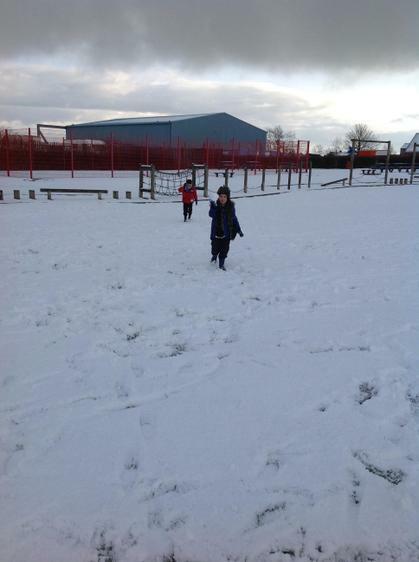 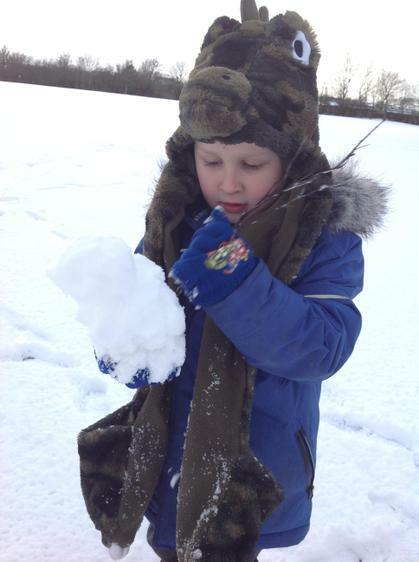 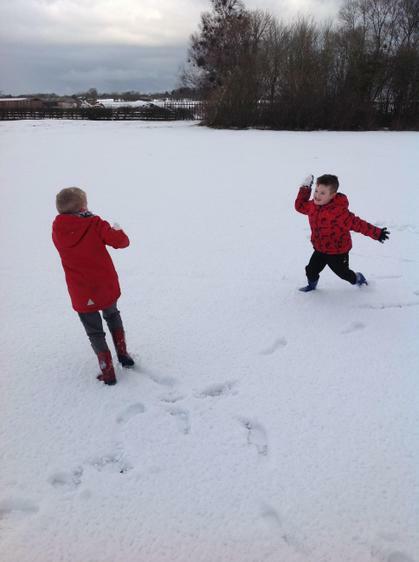 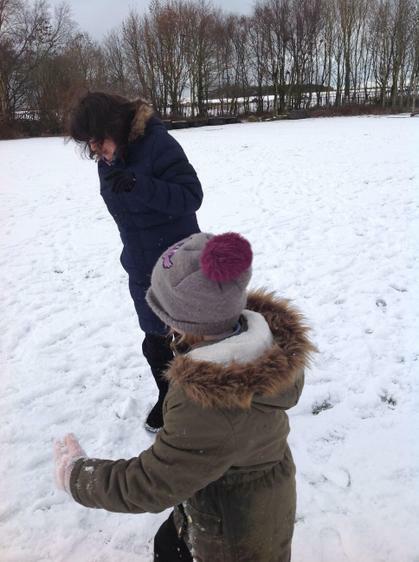 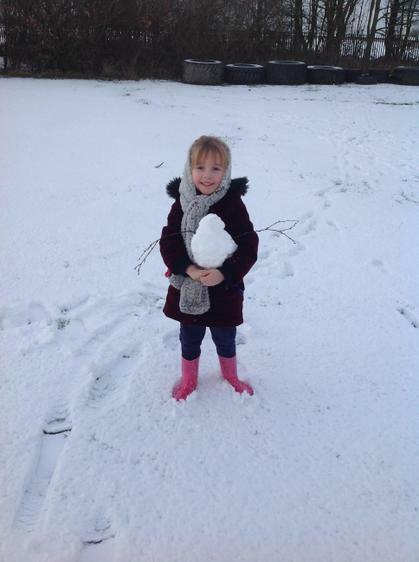 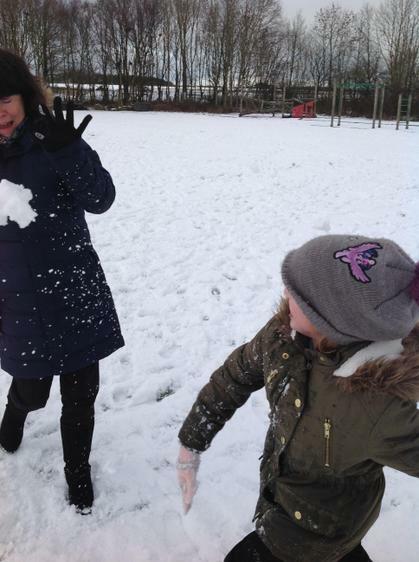 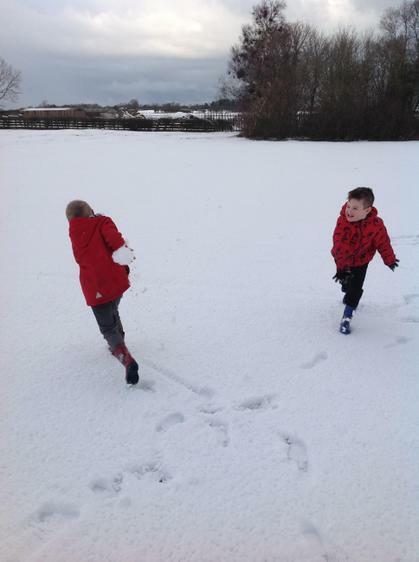 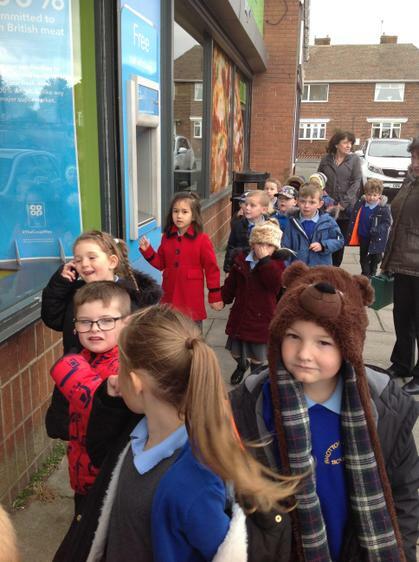 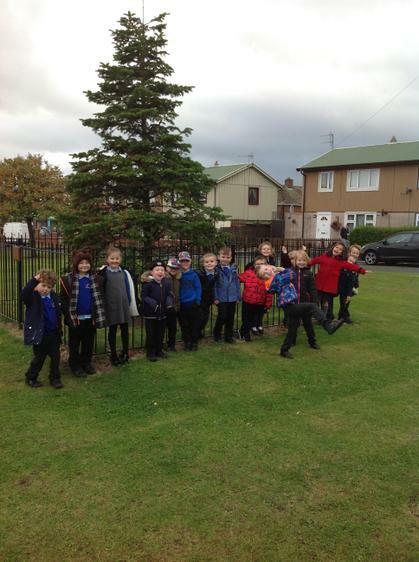 Last week we went for a walk around Shotton. 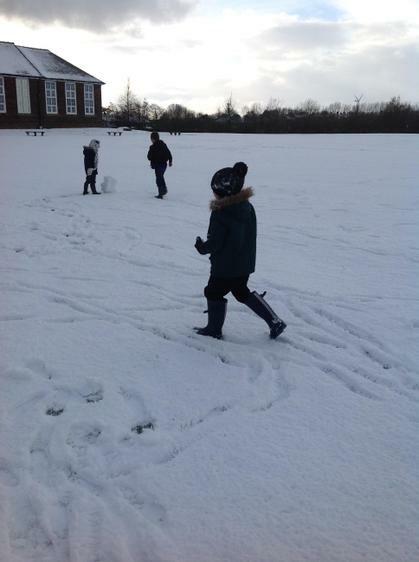 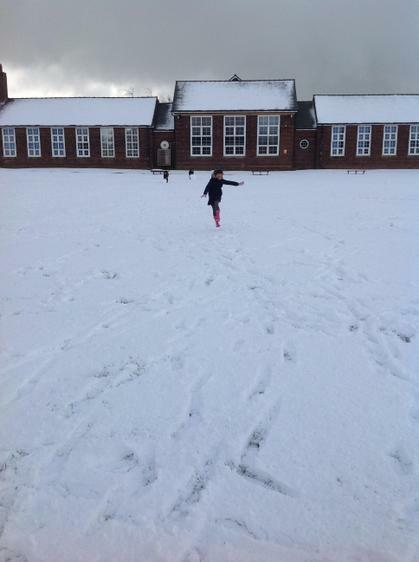 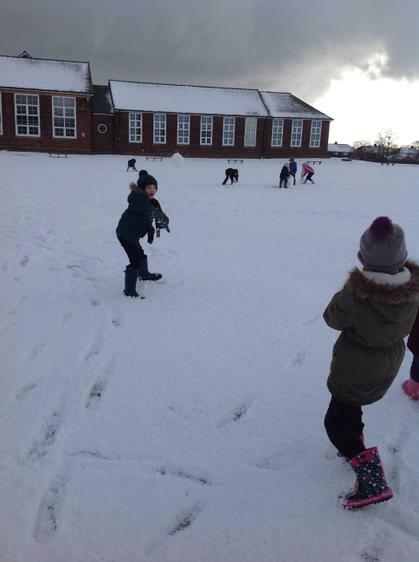 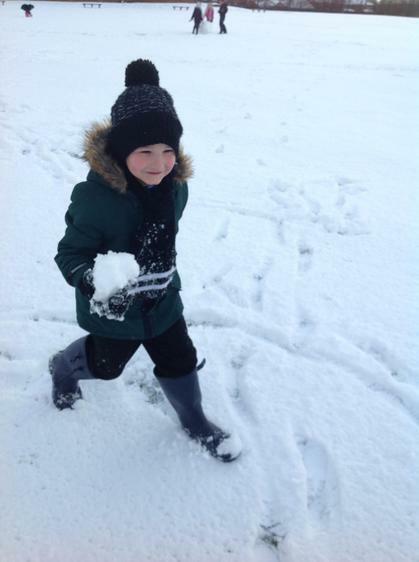 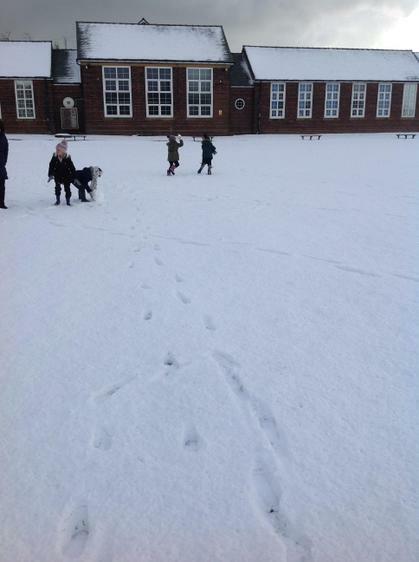 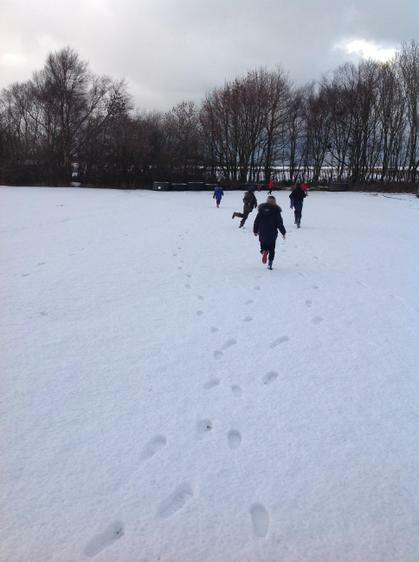 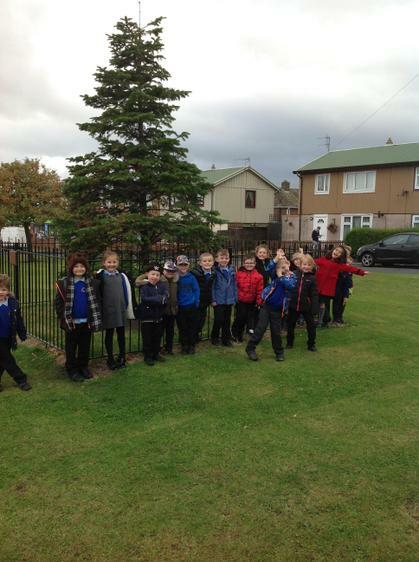 We walked from school to the library and noticed lots of local landmarks and amenities along the way such as the church, war memorial, the doctors surgery, the post office and the 'Christmas tree'. 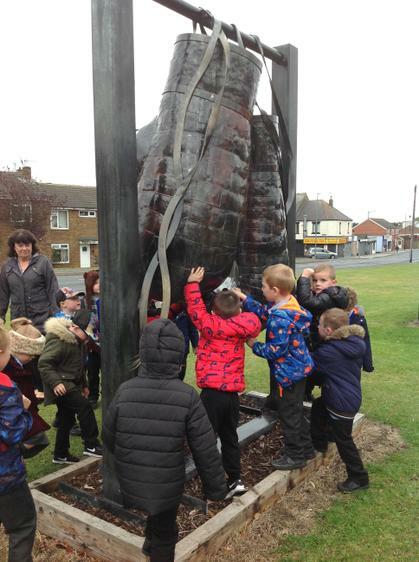 We also looked at the interesting sculpture on the green which is an enormous pair of metal boxing gloves. 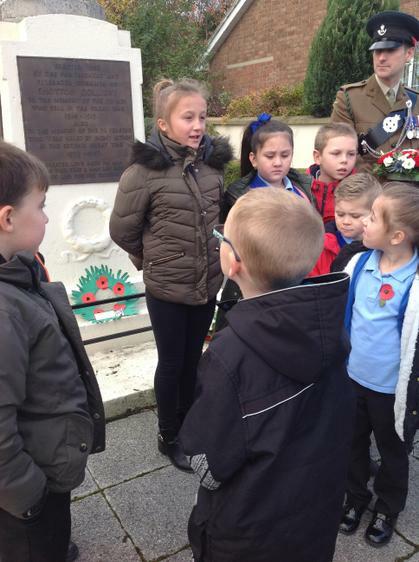 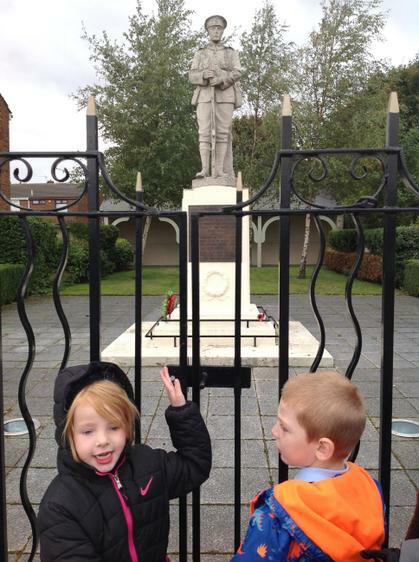 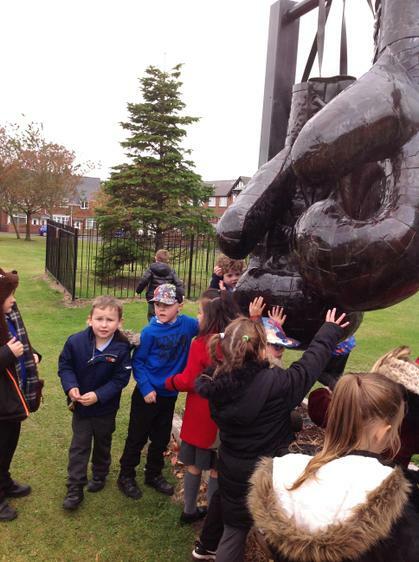 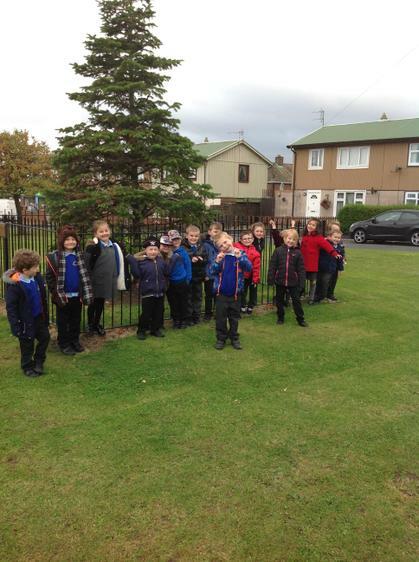 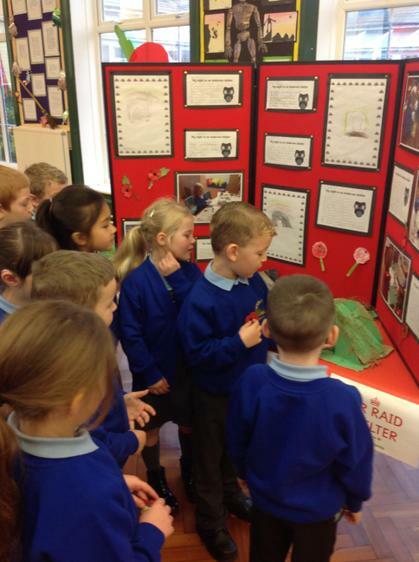 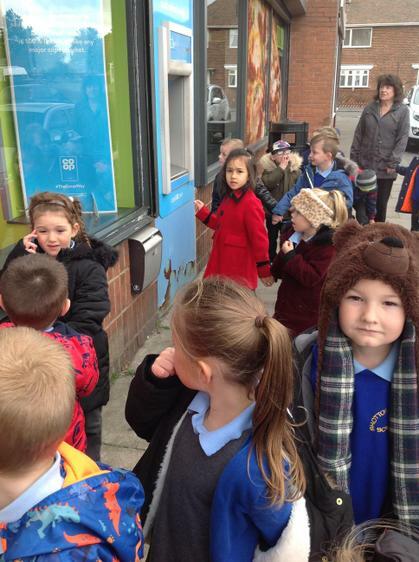 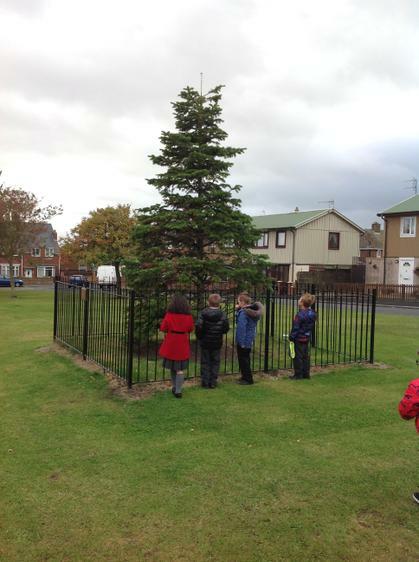 Some of the children were able to explain that the sculpture was there to commemorate a famous boxer from the area. 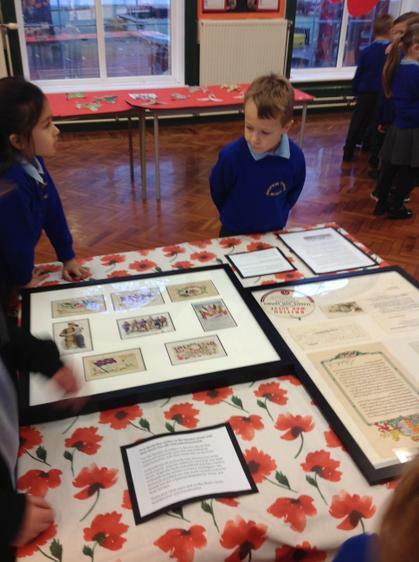 When we returned to school we looked up the boxer on the internet and discovered his name was Maurice Cullen and that he held the British Lightweight boxing title four times in his career! 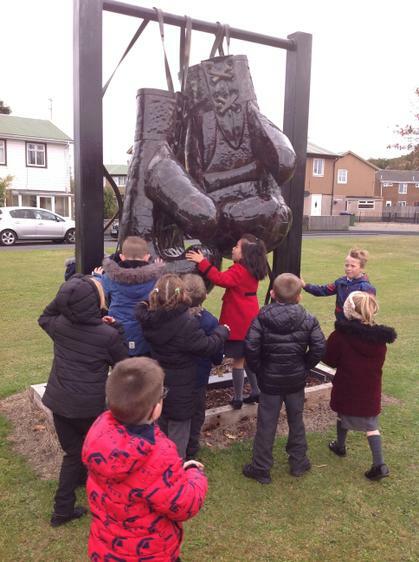 The children really enjoyed the walk and those who live in the village were excited to be tour guides and see their homes en route! 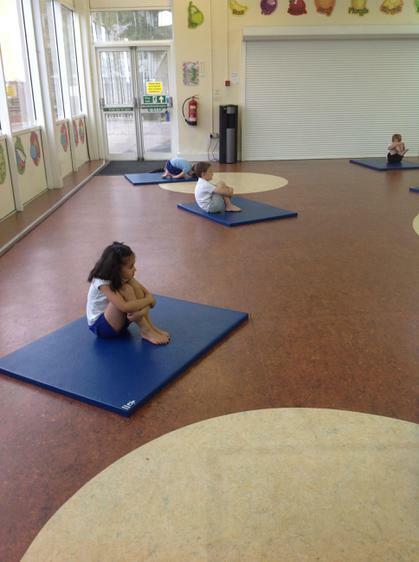 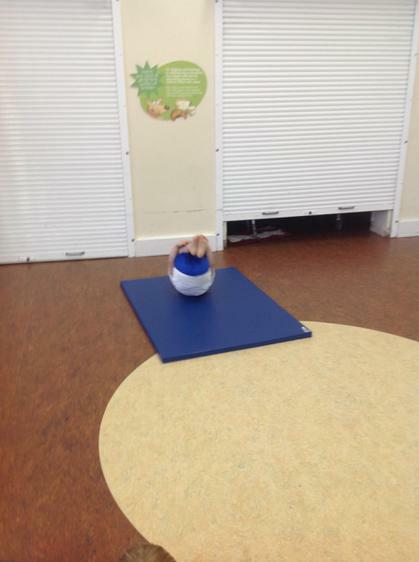 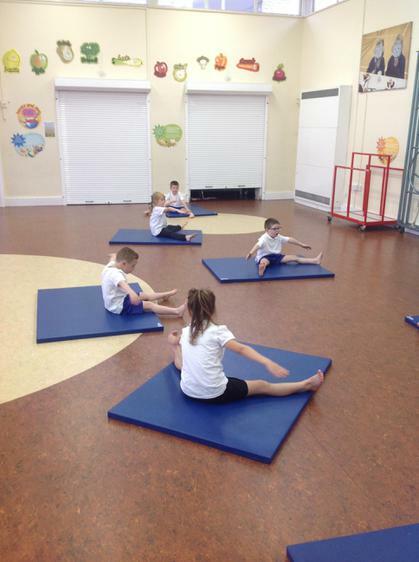 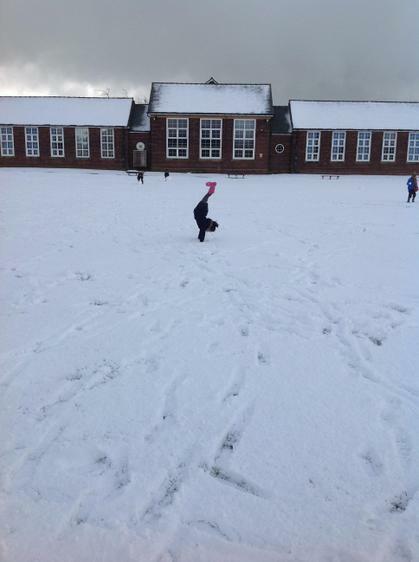 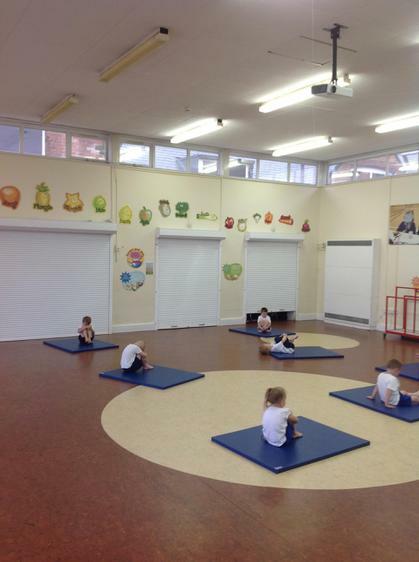 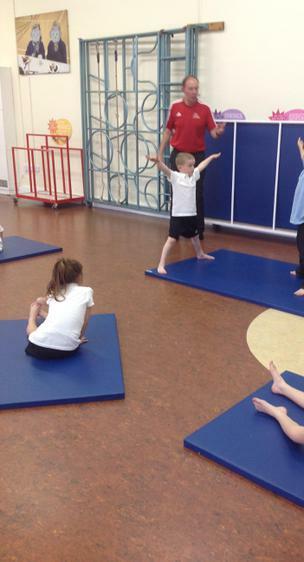 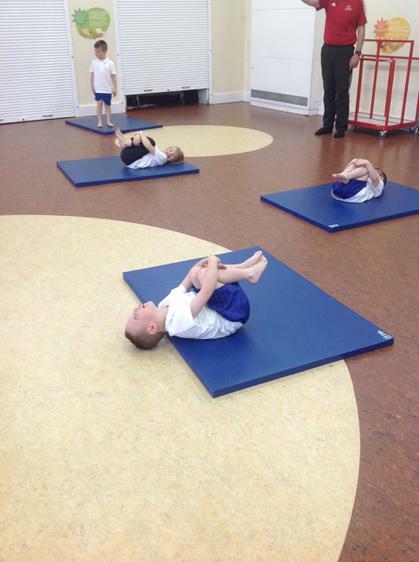 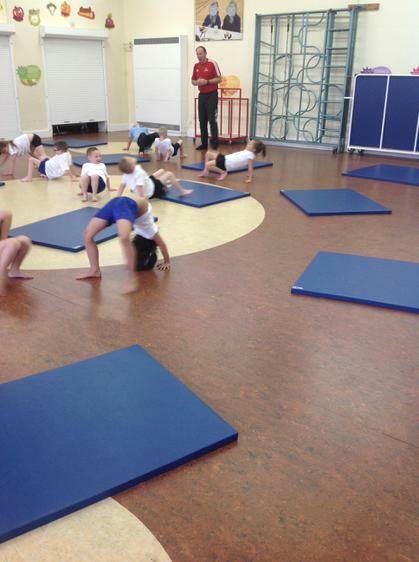 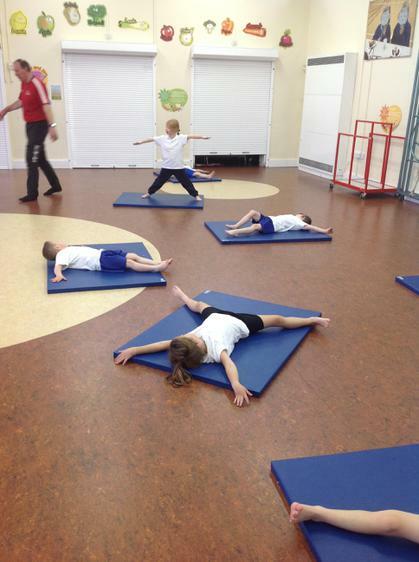 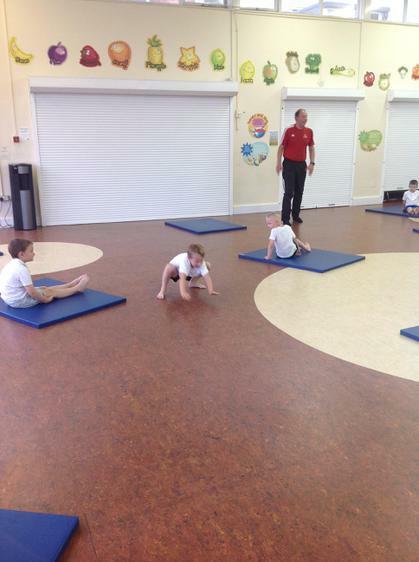 This term our PE unit is gymnastics. 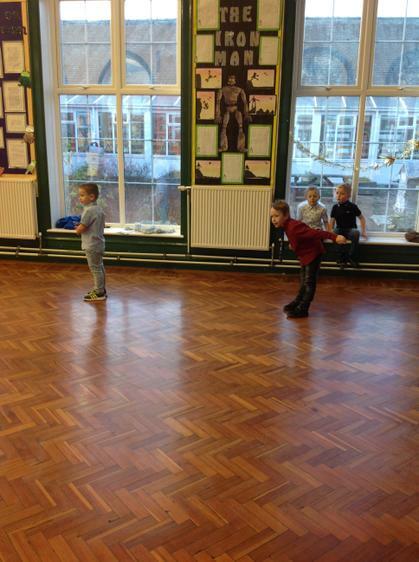 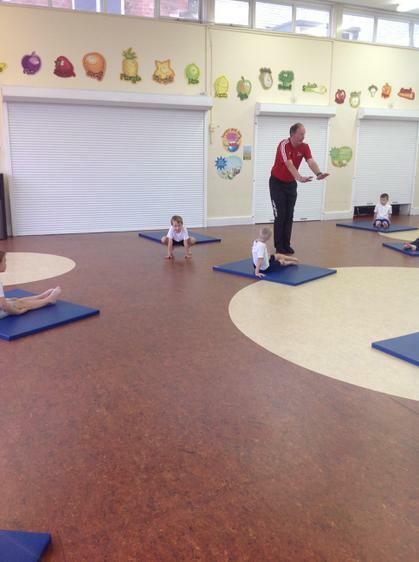 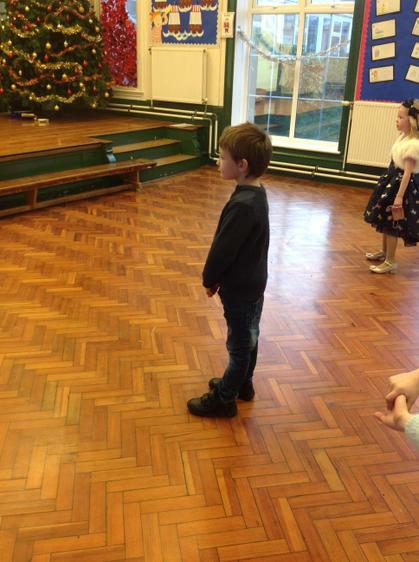 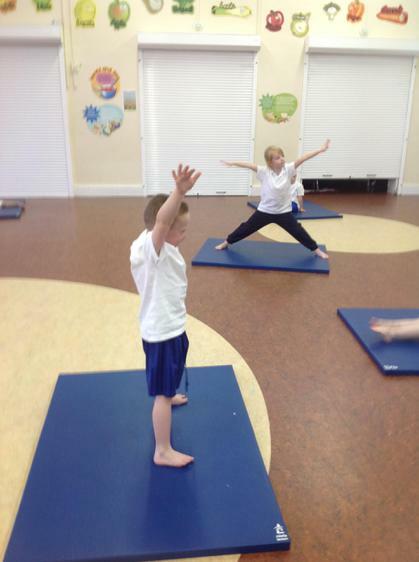 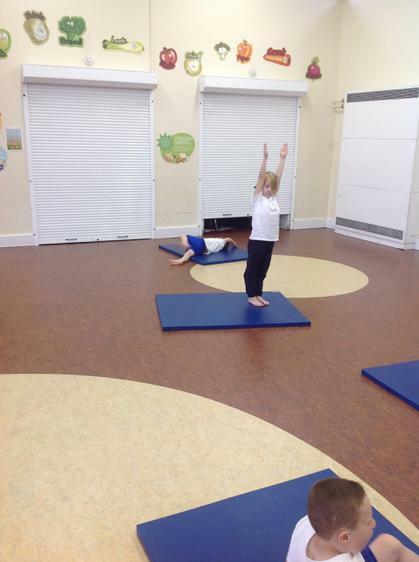 Here we are practising how to move in different ways, walk like a gymnast and building up our range of moves. 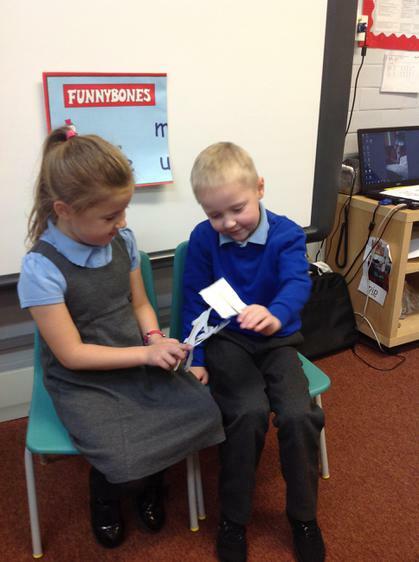 So far we have learnt how to make a star shape, a tuck, a straight shape, a straddle and a roll. 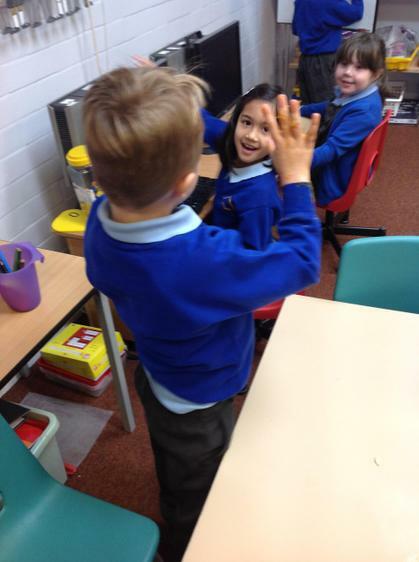 We are building up the different moves into short routines. 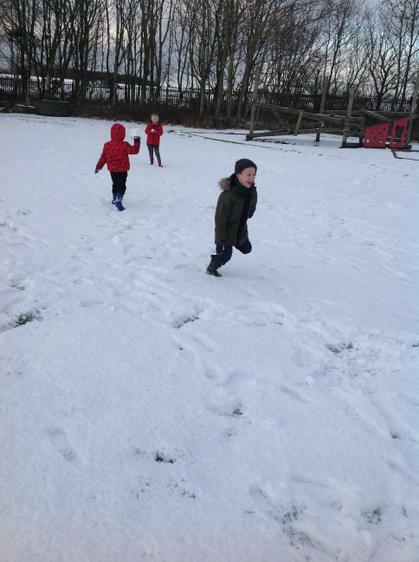 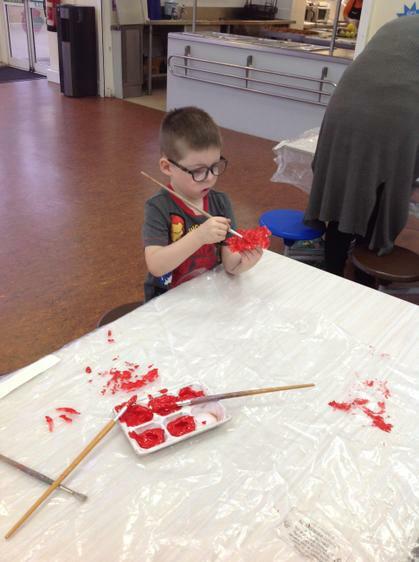 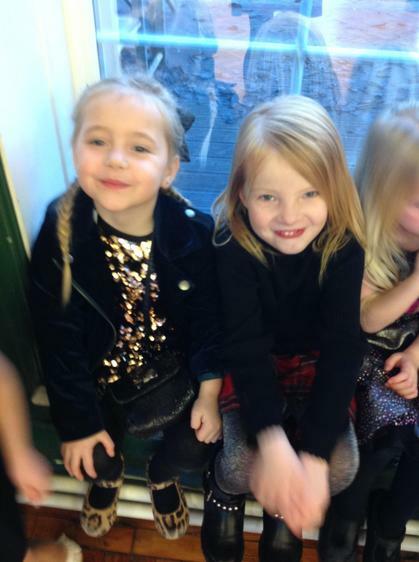 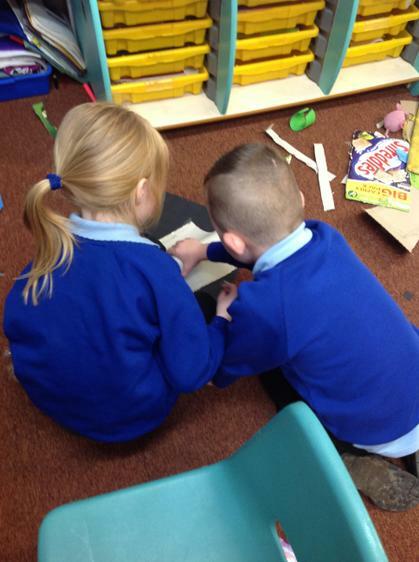 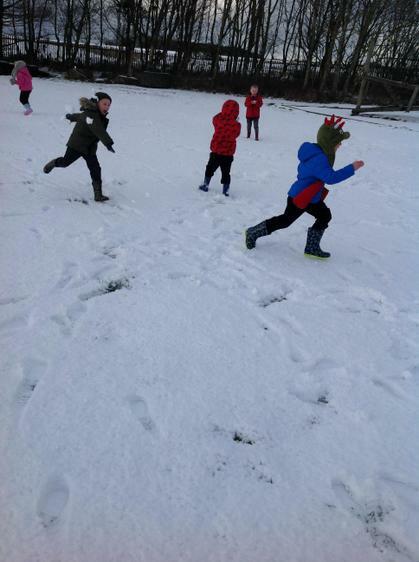 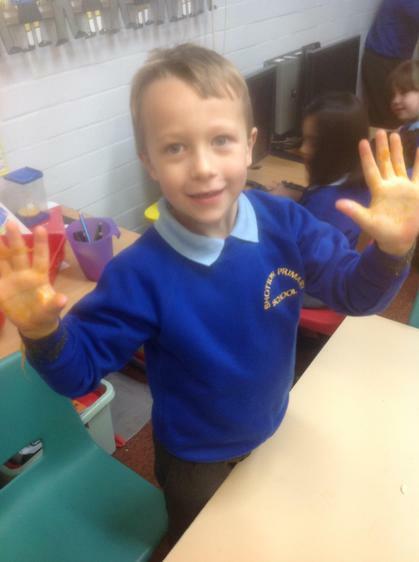 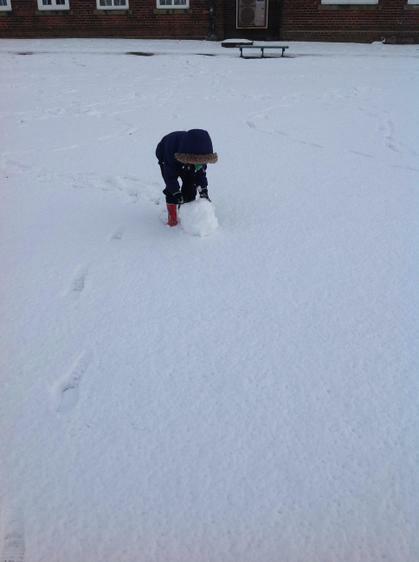 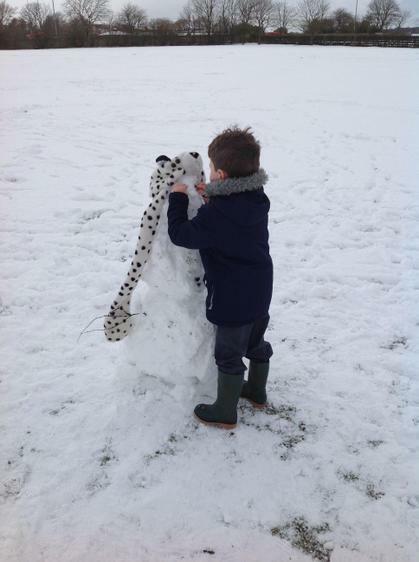 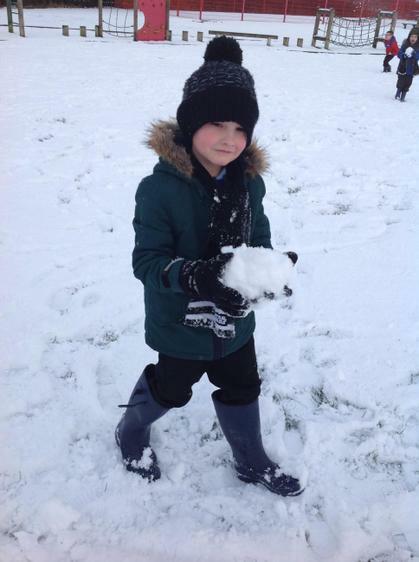 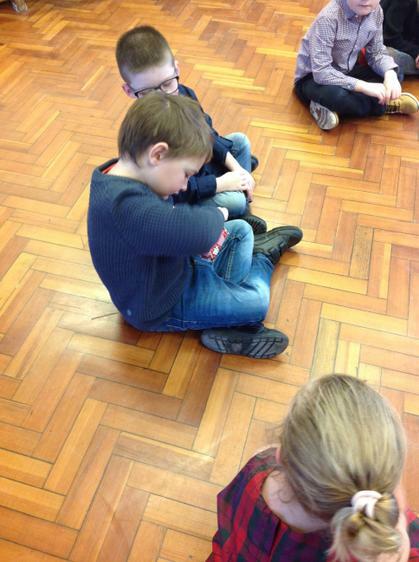 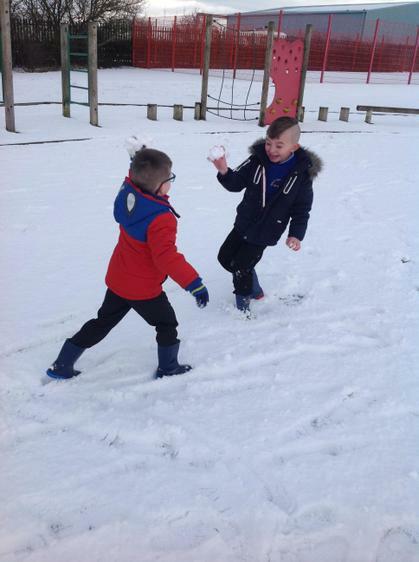 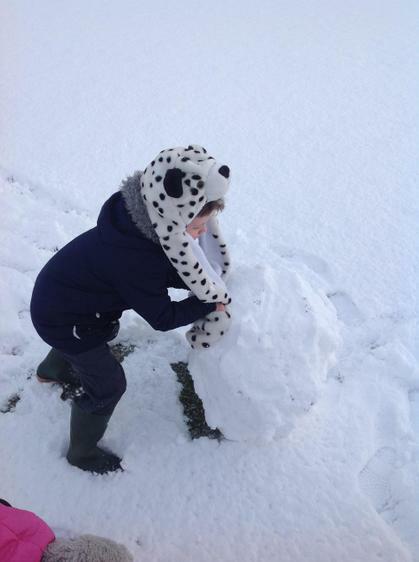 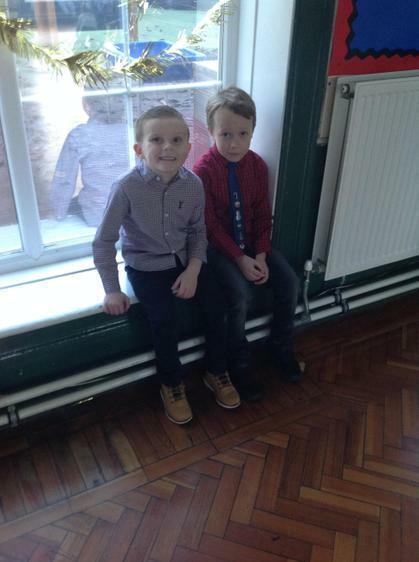 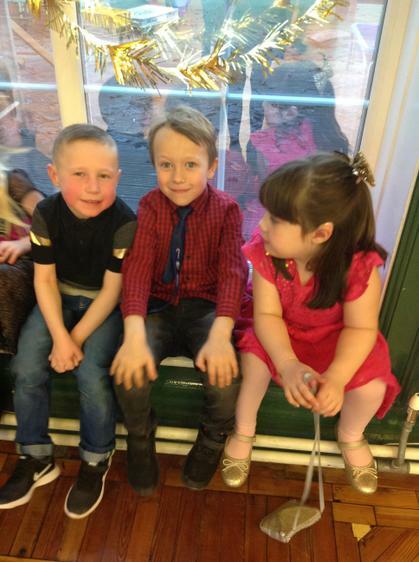 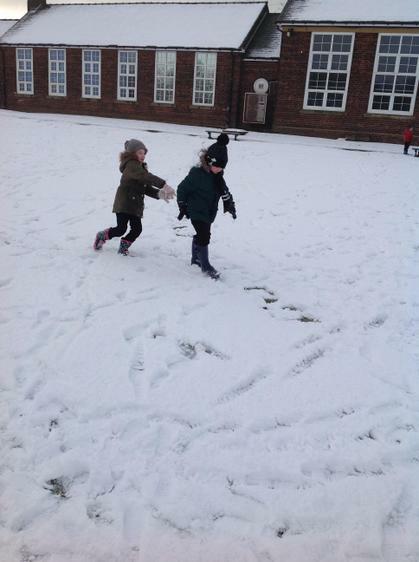 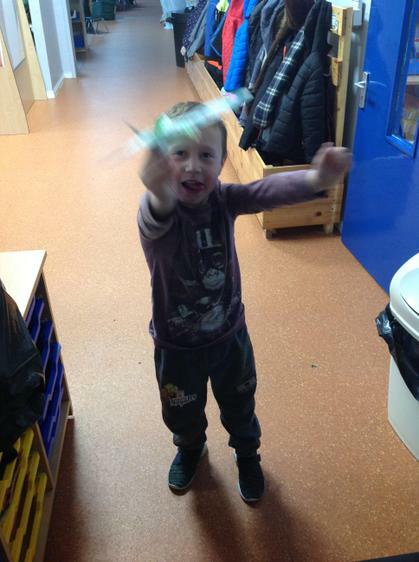 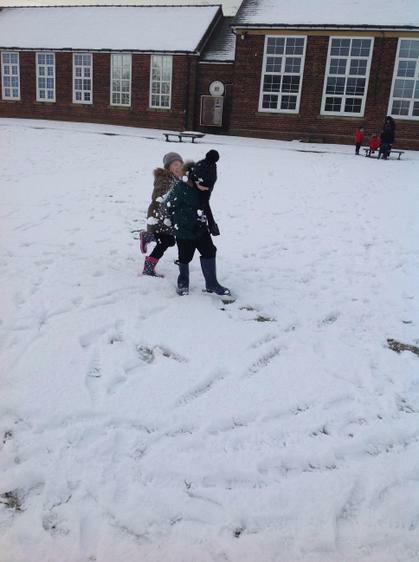 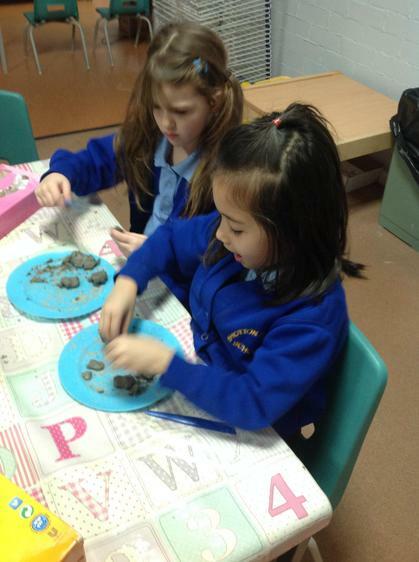 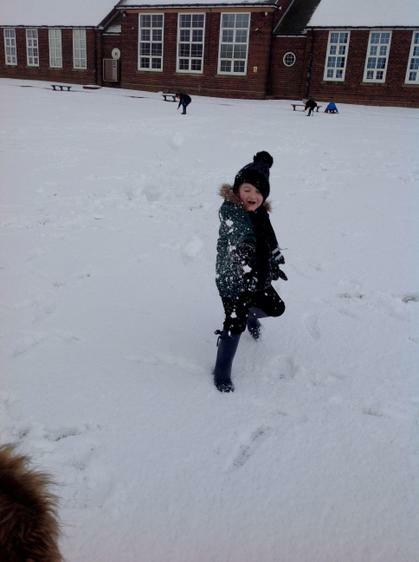 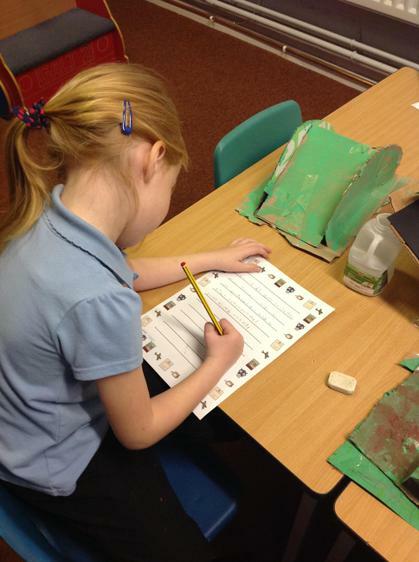 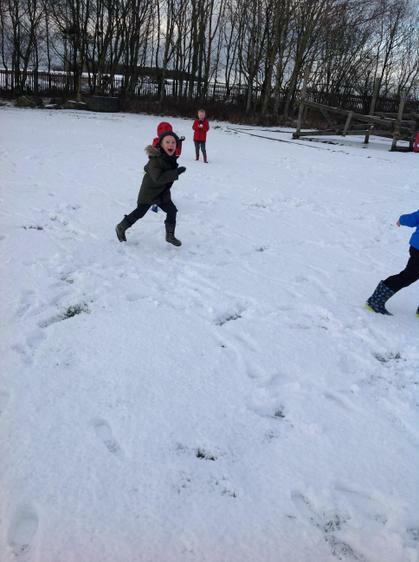 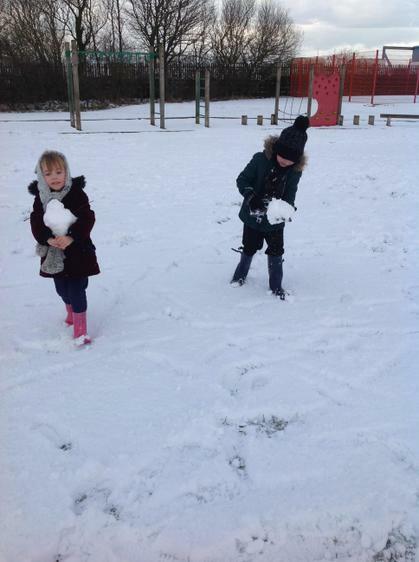 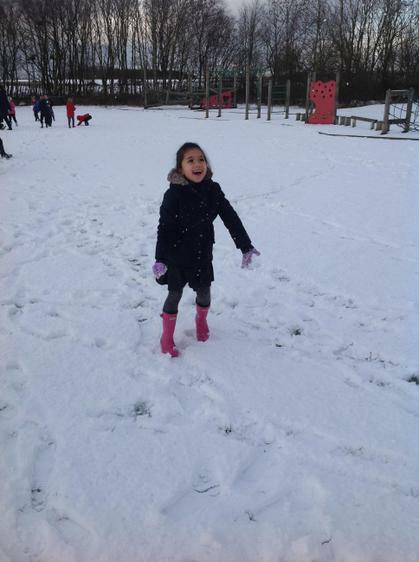 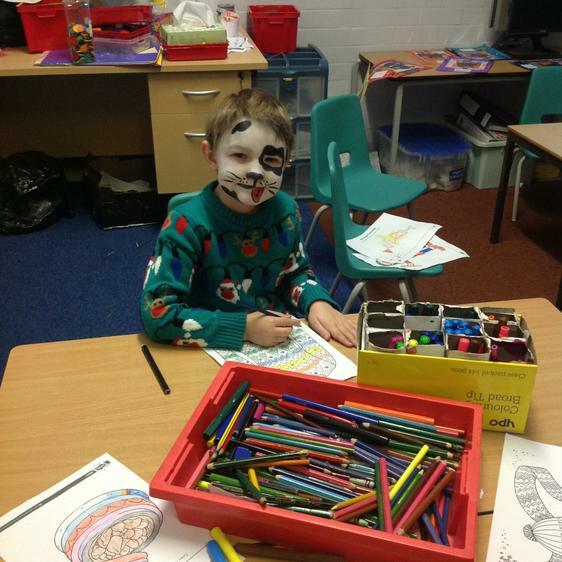 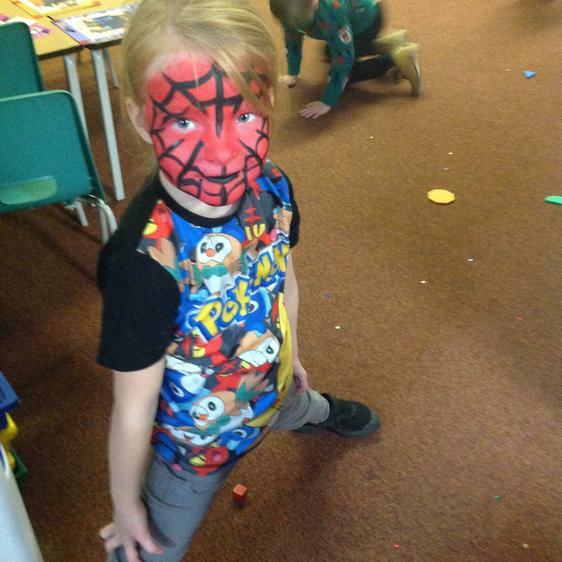 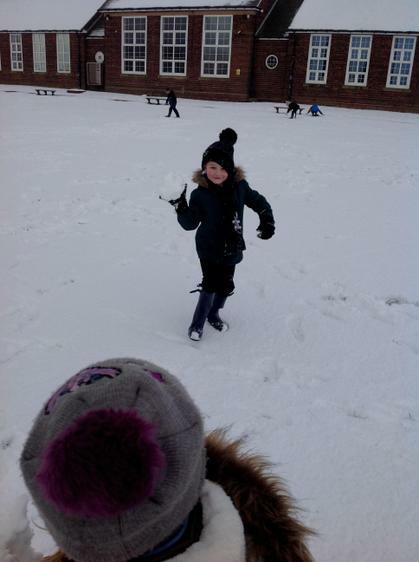 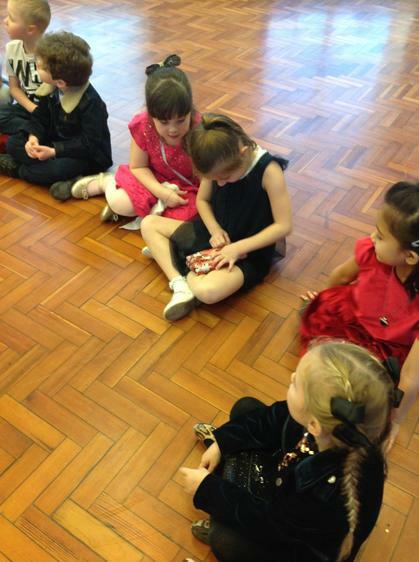 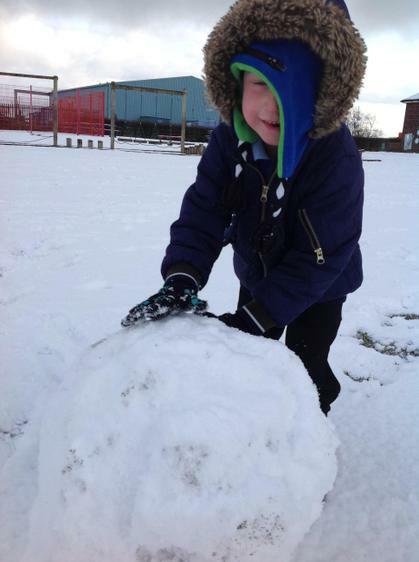 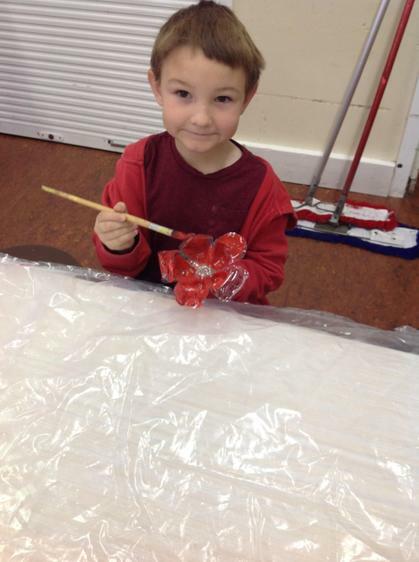 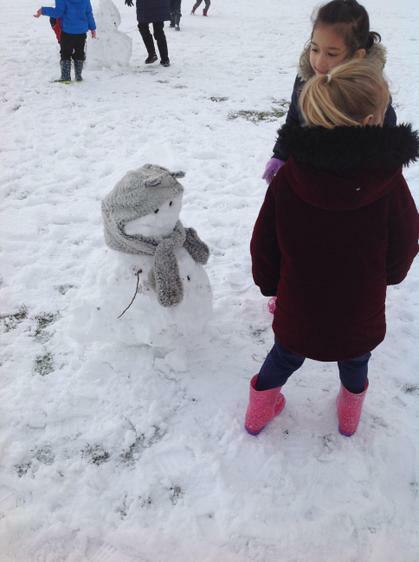 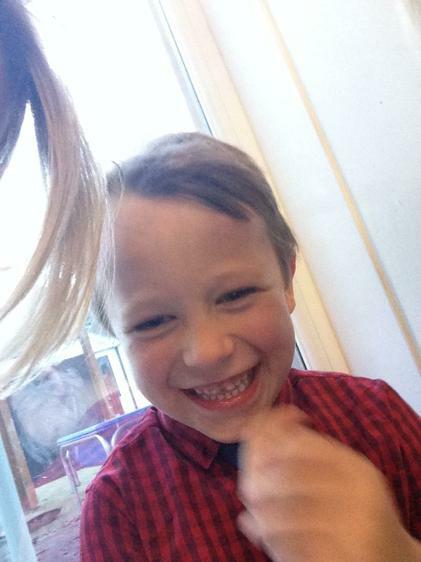 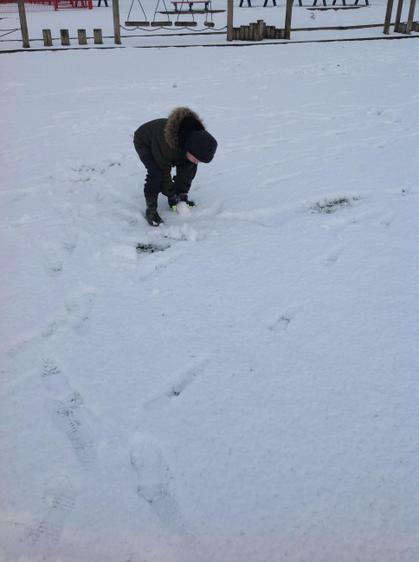 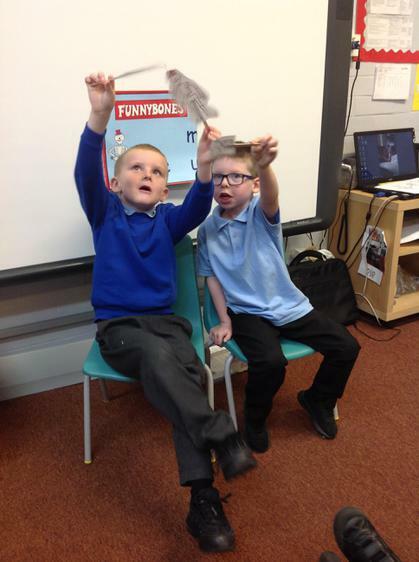 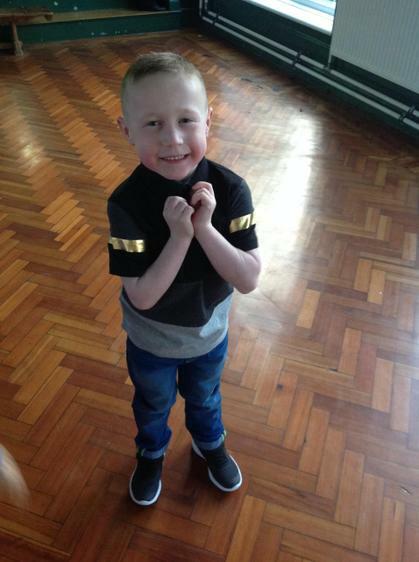 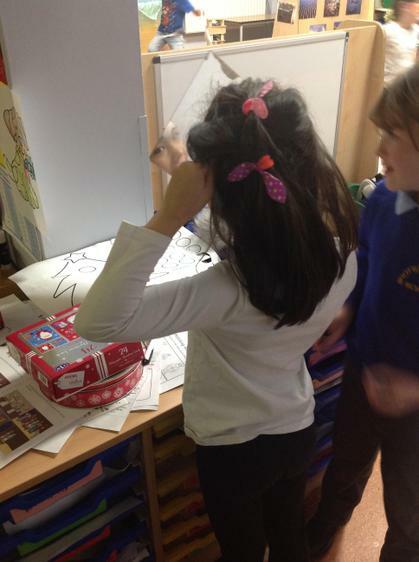 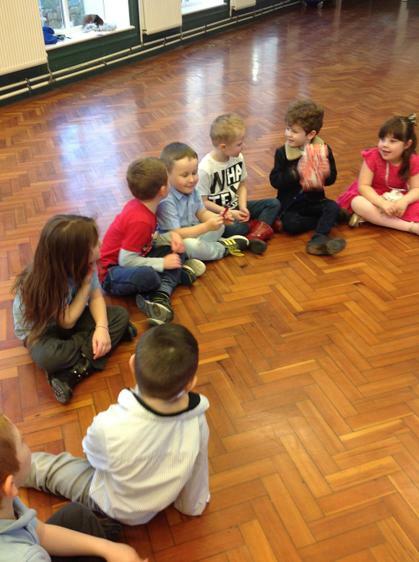 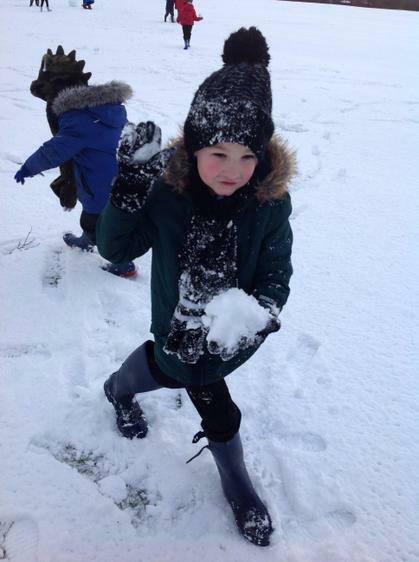 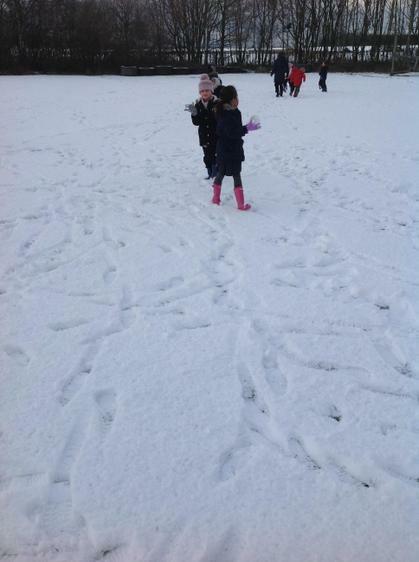 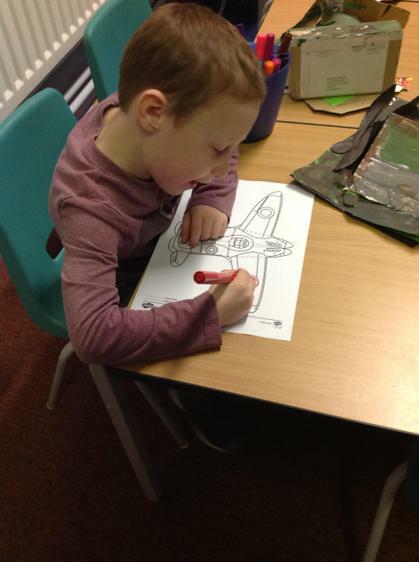 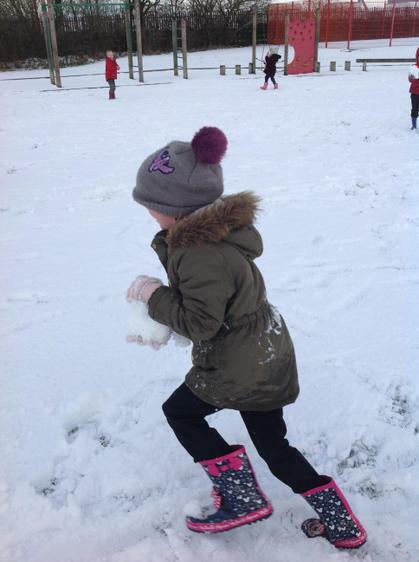 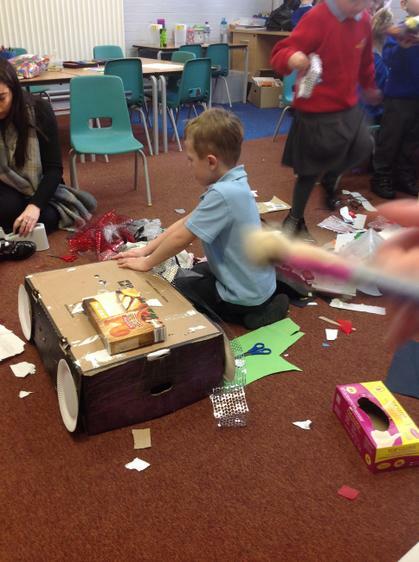 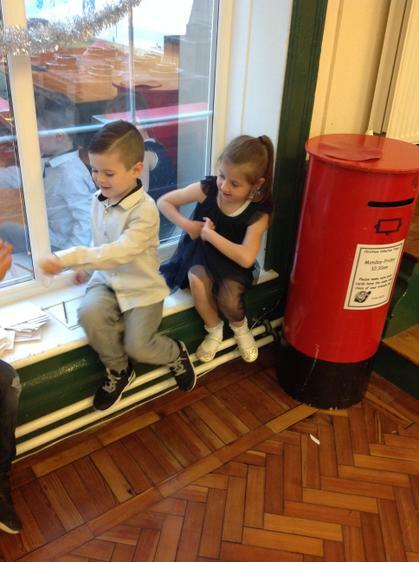 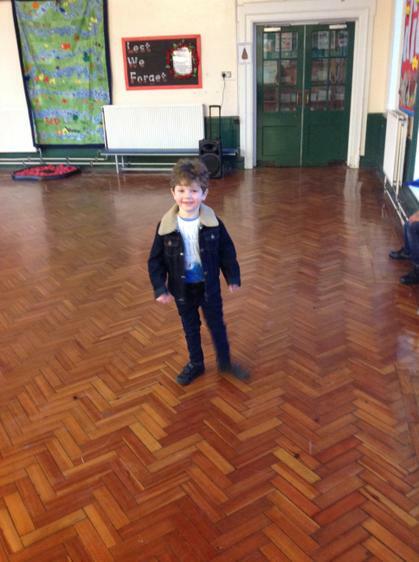 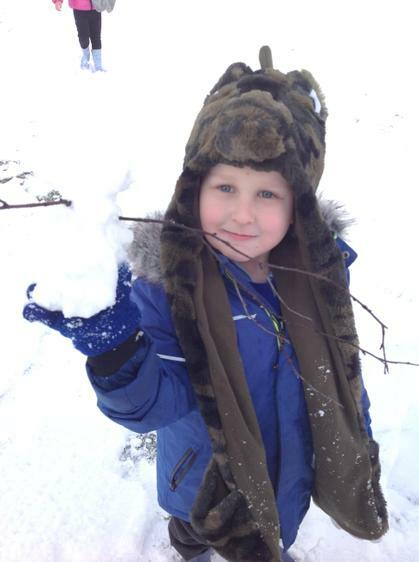 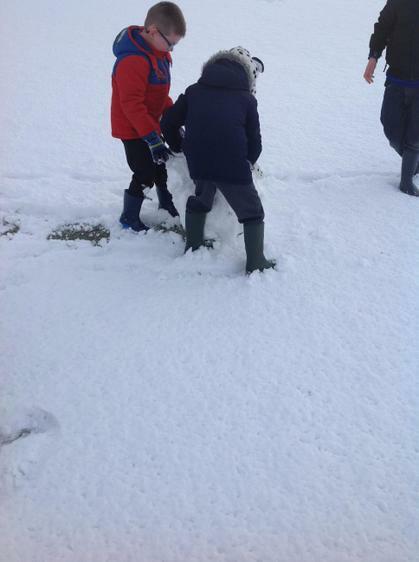 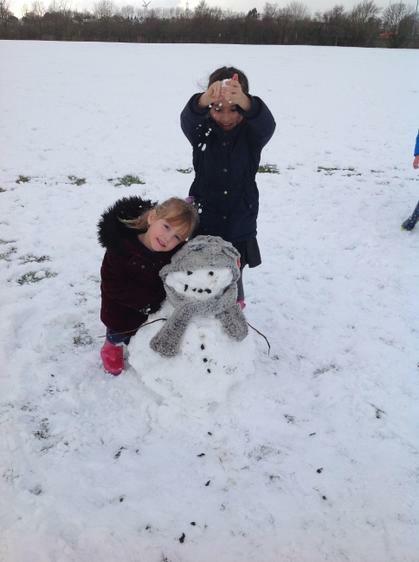 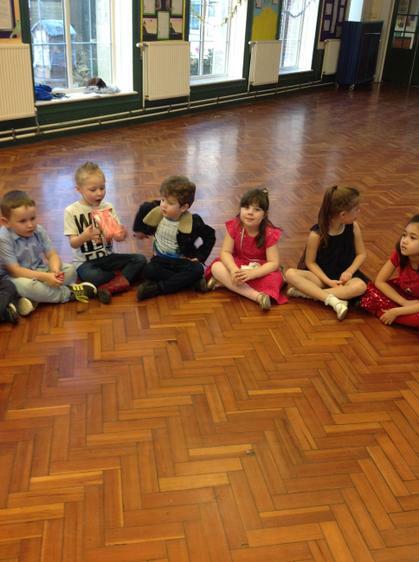 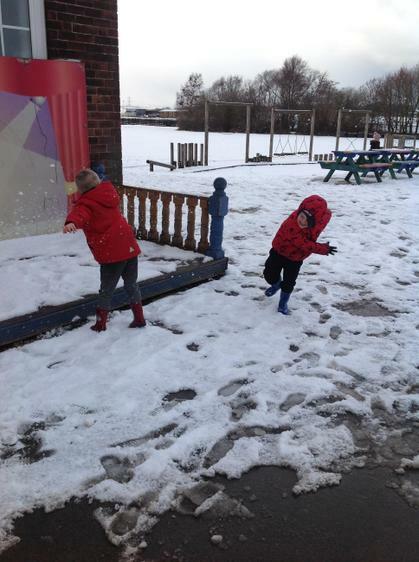 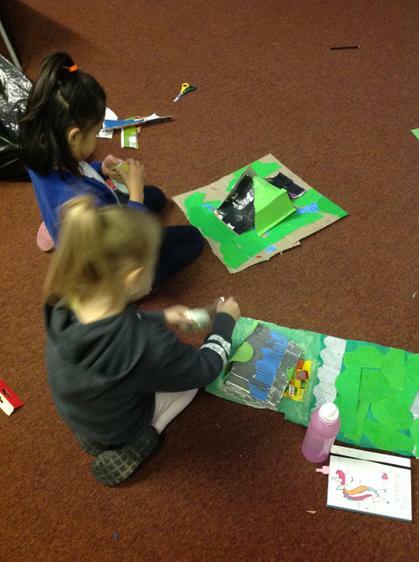 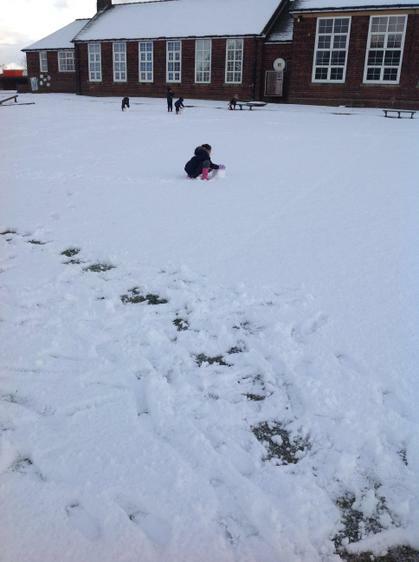 The children are having lots of fun, learning fast and improving each week. 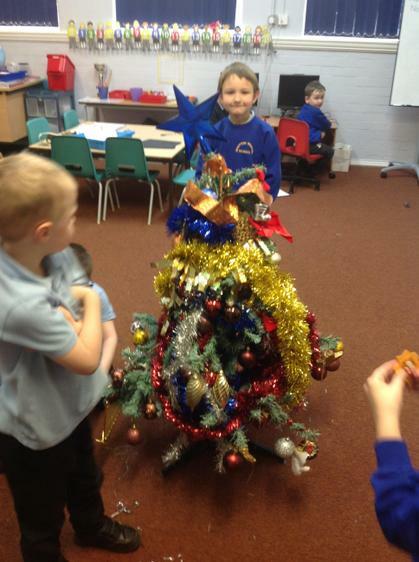 Well done 1C!